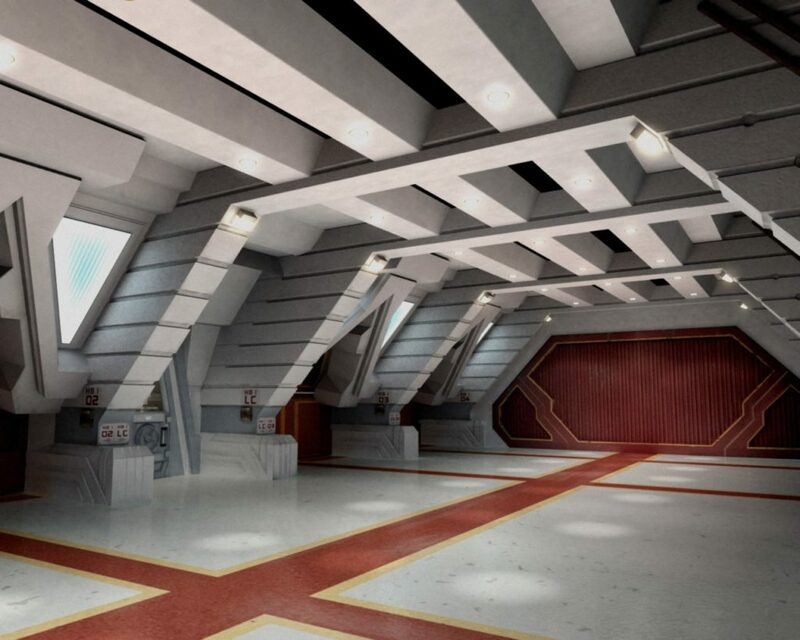 The most popular post on this blog has far and away been my reconstruction of the Battlestar Galactica hangar deck. I mentioned I intended to write further analyses later on. 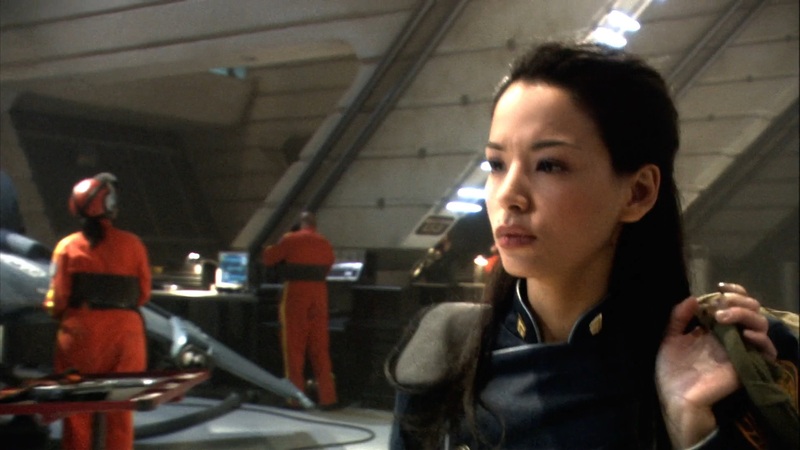 This post will discuss the war-era version of Galactica, seen in the prequel movie Blood and Chome. 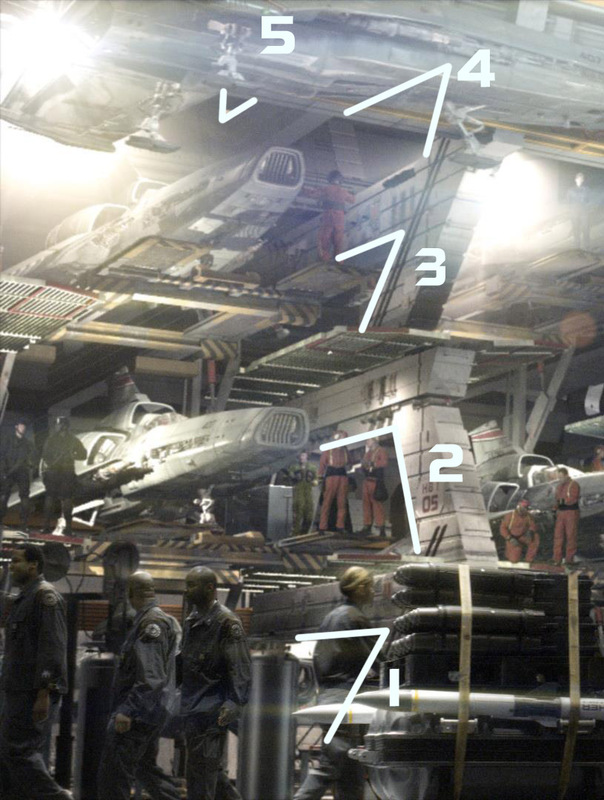 The B&C hangar deck was designed more loosely than the original version, and things don’t fit together as easily as they did in the first article. I’m going to try and come up with a compromise interior and exterior that works together, but still looks similar enough to what was actually on-screen that the casual observer might not notice if a hypothetical Blood and Chrome II (or some sort of fan-art) used my design. 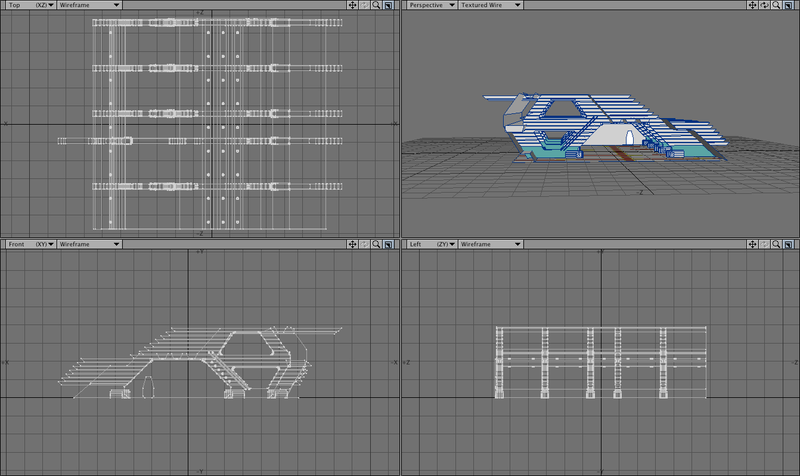 I’ll be using the original set blueprints as a base, and hacking them into something resembling the B&C design. 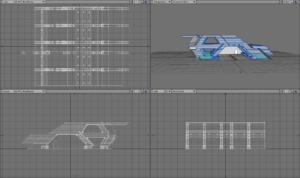 These are mostly intended to be layout guides if and when I model the hangar myself later on, so they’re going to be pretty rough, and missing some features. On the Galactica, there are five clusters of eight launch tubes each. 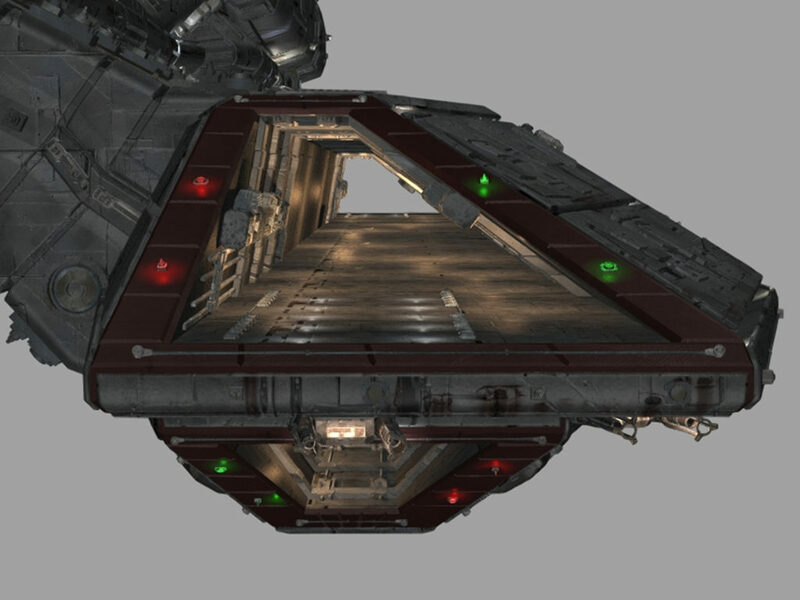 Each cluster takes up four “frames” of the hull. The launch tubes in the cluster are arranged with two tubes, then a rib, then four tubes (with a cutout where the rib should be), another rib, and two more tubes. 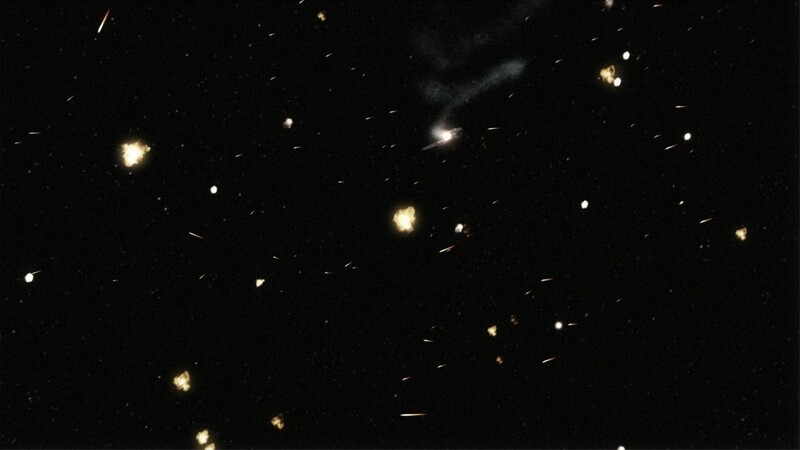 Each cluster is separated by a single empty frame. It’ll be important later, so I’ll note that while I’m confident the actual model of the landing deck is identical to the original with the jetways for larger ships and the six aircraft elevators, we only actually see a small portion of the rear, so we only know that there’s one aircraft elevator of this type. There could be anything behind the camera’s point-of-view. 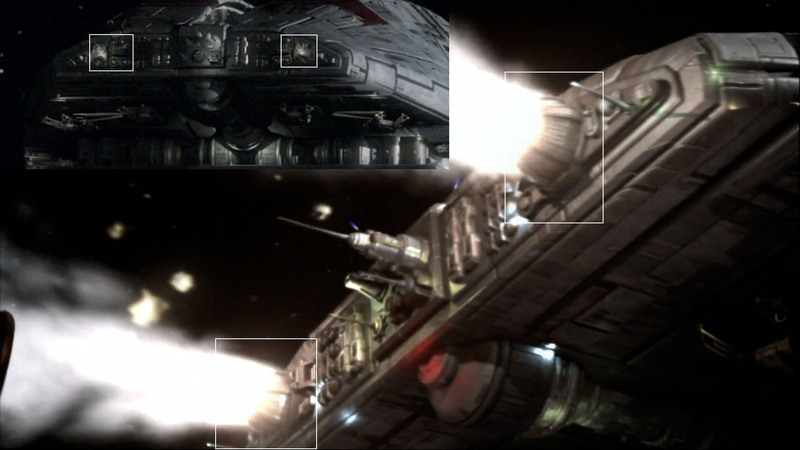 Not that it matters in this post, but let’s just note that there were two versions of the Galactica made for B&C, with different arrangements for the additional weapons. One appeared in the opening montage and in the closing scenes of the movie, and the other was seen in the scenes were Adama arrives, then departs, in the beginning. Since it was shown more prominently, I regard the version from the arrival scene as correct, and the other one as the error. 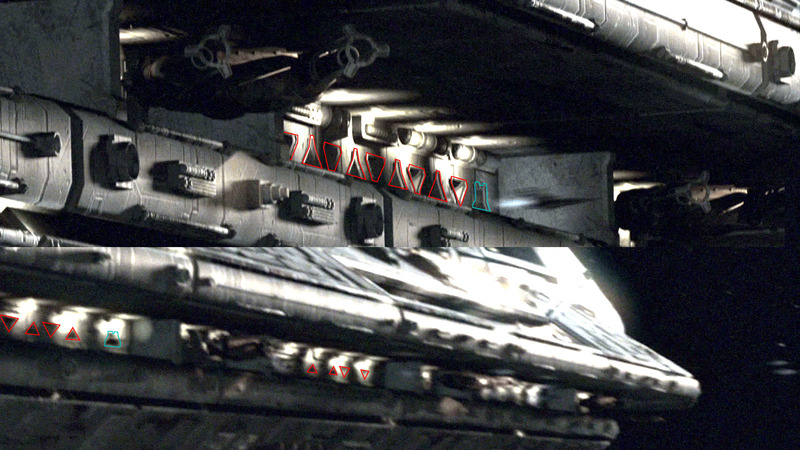 By the way, if anyone knows how this happened, or if it was intentional and there’s some deeper meaning in the canon to the Galactica having her guns rearranged while Adama was off playing ice-commando, drop me a line with the contact button on the upper right. We can alternate [the “Viper Hotstack”] with large elevator modules that rise to the landing deck, or shop modules…. The basic layout remains the same. 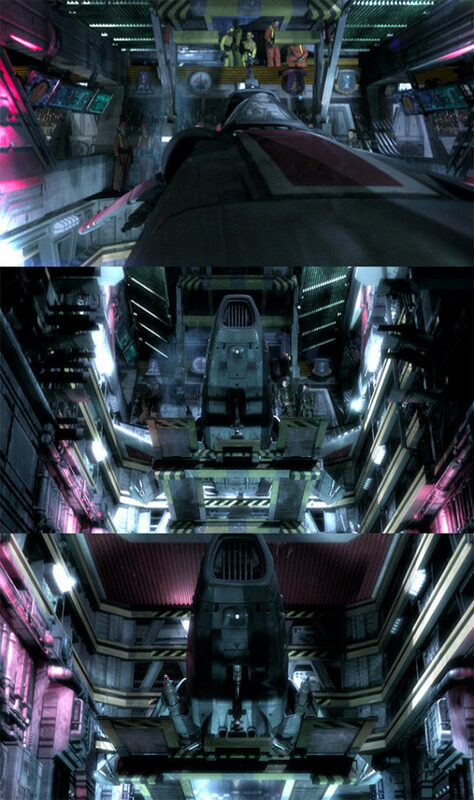 The most prevalent module was the “Hotstack.” The hangar is four levels high, with three levels in the stack open to the air, and the topmost peaking out from behind the ceiling. Vipers lower from an apparent, barely-visible fifth level. The outboard side has an enclosed control room running the length of the pod at the same height as the second level, and has triangular sections at deck level that that seem to lead to the launch tubes, though we never see one clearly. The roof of the control balcony has railings and people standing on it, though how they got there and what business they have up there is anyone’s guess. 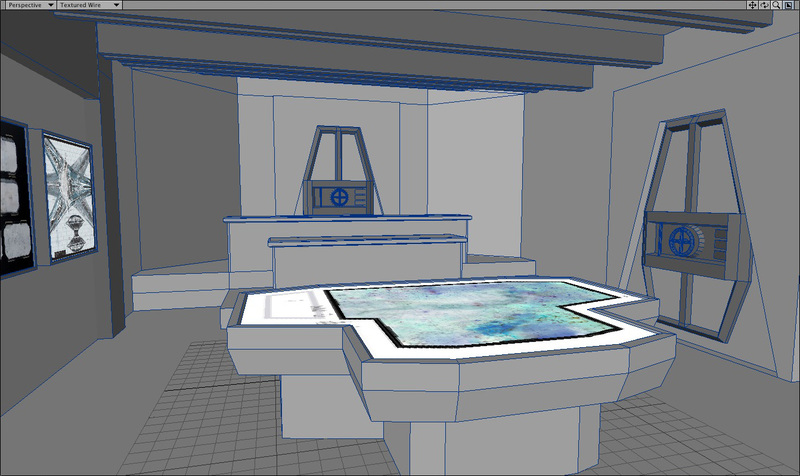 Given the rough texturing, it obviously wasn’t a section of the set expected to get much attention. 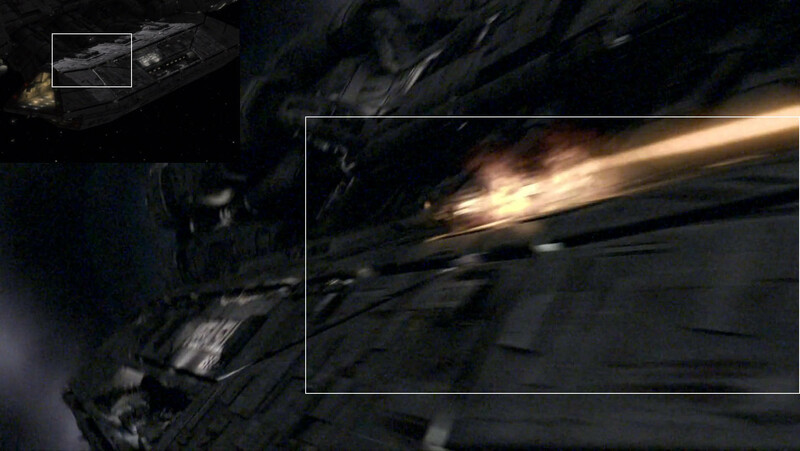 After all, it’s only clearly visible in one-and-a-half shots for a second or so. The center roof has a system of carts and gantries running along rails, apparently moving Vipers from one upper level stack to another. There also seems to be some kind of fixed Viper bridge from inboard to outboard about one and a half levels up, just before the elevators. 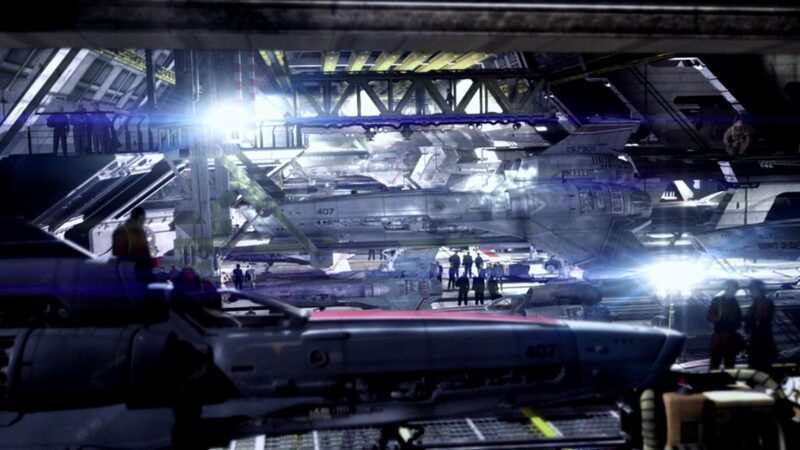 It seems to be the match of the structure the Viper in the foreground is sitting on. The entire configuration is about 21 Viper-stacks long. 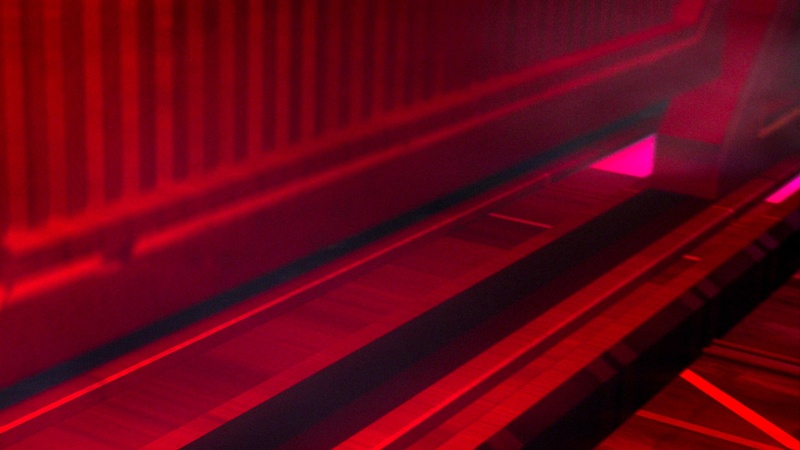 The “shop module” seems to be identical to the Hotstack on the inboard side. Possibly a bit wider. The outboard side has the dividers moved a bit wider to accommodate the large, nuBSG-style door. I’m going to assume that they don’t actually meet, because the inboard side doesn’t look that much wider than the regular stack. This door seems to be the same size as the elevator doors in the parent series, and at the end of an elevator-sized cubby. That’s probably not an elevator, though. 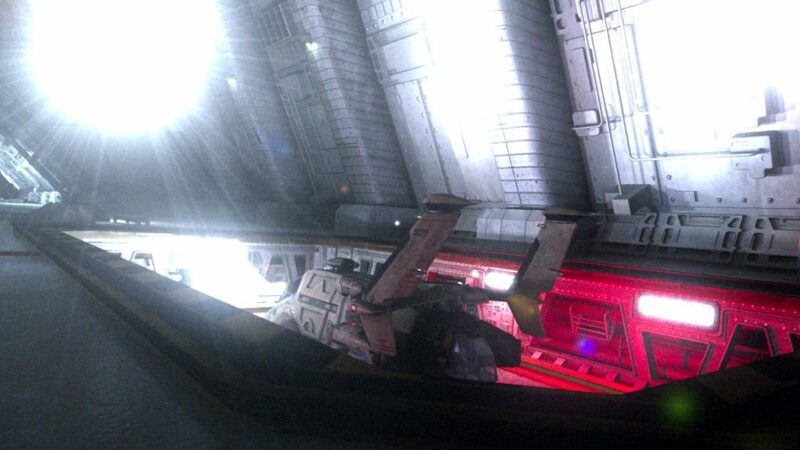 The shop module is only visible in this shot of the Wild Weasel. It’s difficult to be sure, because the apparent launch tube entrances are now deep in shadow, and possibly missing entirely, and the camera angles are low enough that most of the background is taken up by the ceiling. The fact that the door is the same scale as the ones on the original hangar does let me estimate the size of the new, much larger doors: About 175% or the originals. 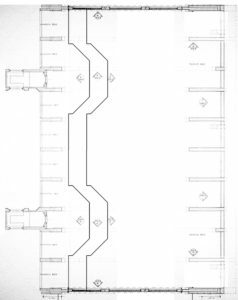 This isn’t quite the clean doubling I was hoping for.1I started drafting this post and making the diagrams long before I finished and posted it, and I cannot for the life of me remember how I deduced the size of the large doors from the regular-sized ones. Possibly from the height? 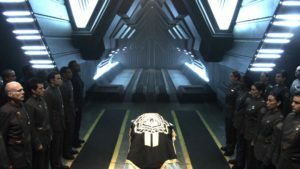 There’s another briefly-seen segment which may be part of the shop module, where Adama first climbs into his Viper at the end. 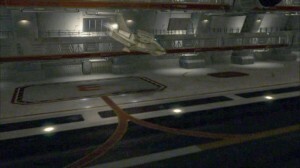 Notably, it seems to show a second hangar deck running parallel to the main one. There are definitely two series-sized elevator-style doors next to each other. Distant shots of the elevators show two Vipers sitting comfortably (diagonally!) on one. Modules fit next to each other, divider to divider, in their units of three. They do not join continuously. There is a small personnel elevator Adama takes at the beginning and end of the film. It doesn’t appear in wide shots, but it seems to be somewhere in the area of the aircraft elevators. There are monitors mounted in the shaft, where they are all but unreadable as people pass by going up and down. To be fair, I’ve also made strange ergonomic choices for virtual sets. 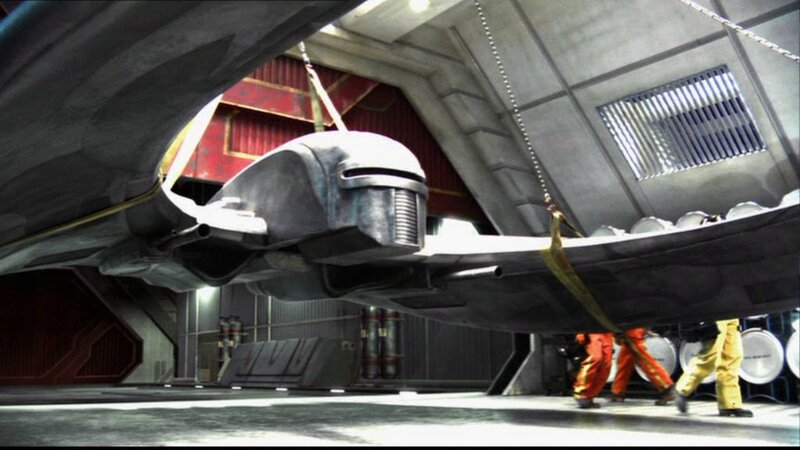 The closing sequence has Adama in his first Viper being lowered into a launch tube. He starts in a redress of the bottom level of the Viper stack and then lowers past another level to the Viper tube. The Viper itself prevents us from seeing if there’s a same-deck Viper door or if they only way into the tube is from above. There are a few ways to deal with this. 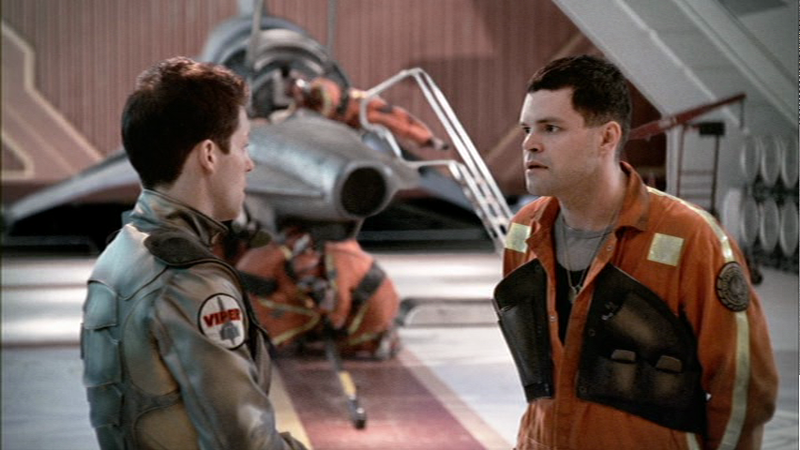 There’s the zig-zag approach, where Vipers come down the Hotstack, are wheeled across the hangar into the launch bay, where they go down another elevator into the tube, which is most consistent with everything we see on-screen. There’s the high deck approach, where the Viper did, in fact, start at the bottom level of the Hotstack, and dropped through a previously unseen trap-door into the tube. 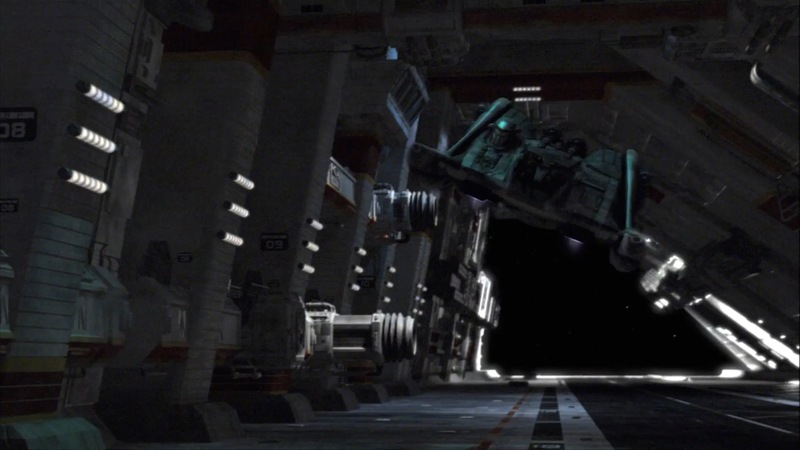 That would mean the apparent launch tube entrances on the hangar deck weren’t that, but if it weren’t for that niggling detail, I’d say this was probably the intent, given the elevator starts at a level that appears to be the bottom of the Hotstack. 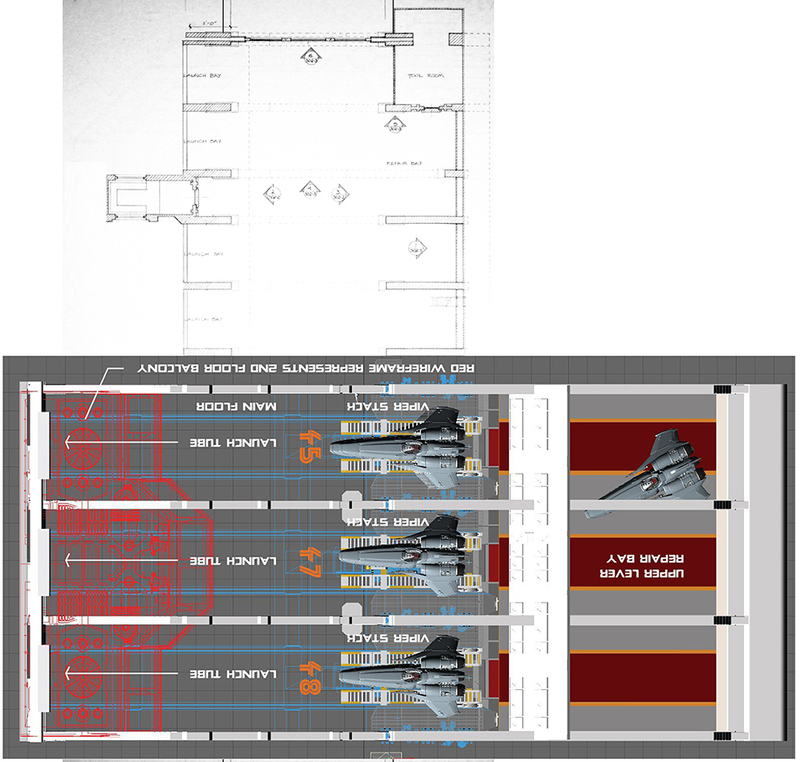 And there’s the overhand approach, which is a more compact version of the zig-zag, where the Vipers go over roof the hangar bay, This has the advantage of preserving the deck-level tube entrances, but is almost totally unsupported by what’s on-screen, adds yet another level to a ceiling height that’s only barely workable and has two independent single-Viper elevator systems that are even more of a pain to get between than the zig-zag. I was going to diagram all of these out, but it seemed like a lot of work to drive home the one fatal flaw with the launch-tube elevator: There’s a fixed amount of space to play with. 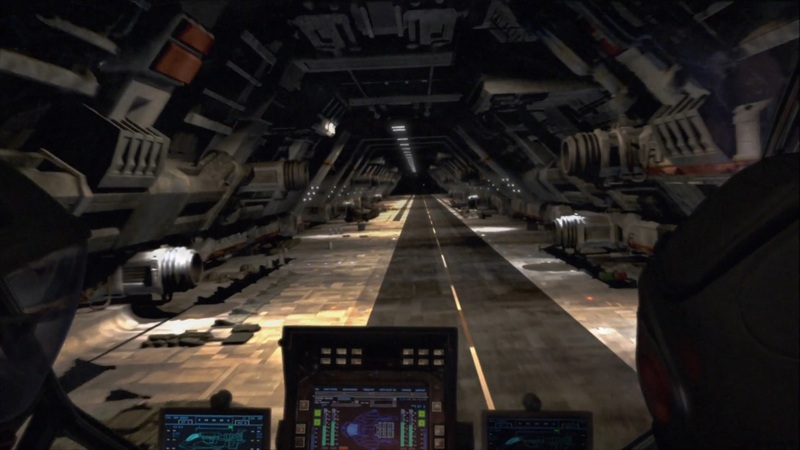 The hangar’s ceiling has to be below the hangar deck, and its floor has to be level with (or above) the launch tubes, and that vertical space is not eight Vipers high. It’s barely three Vipers high. Okay, let’s take what we’ve got and see if we can run with it. First of all, let’s compare the digital set blueprint with the original, scaled to each other. As you can see, aside from being wider along the width of the hangar, each individual launch tube is also wider along the length. 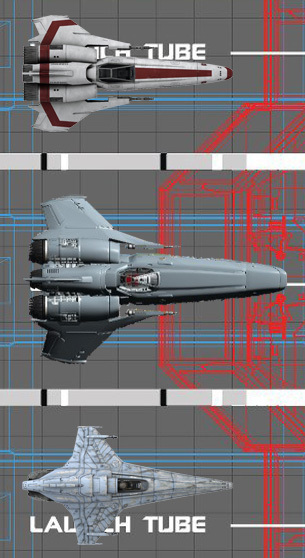 This makes it easy to accommodate Raptors and the apparently-enormous Viper Mark III, but to fit the exterior arrangement of the launch tubes, it’ll have to go. 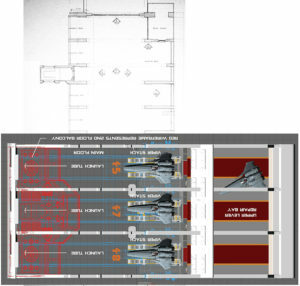 The Upper Level Repair bay, which is barely visible in the show, is also going to be omitted, since it’ll push the hangar deck far enough outward that the elevators would come out on the runway (or the hangar will be sticking well out of the inner side of the flight pod). 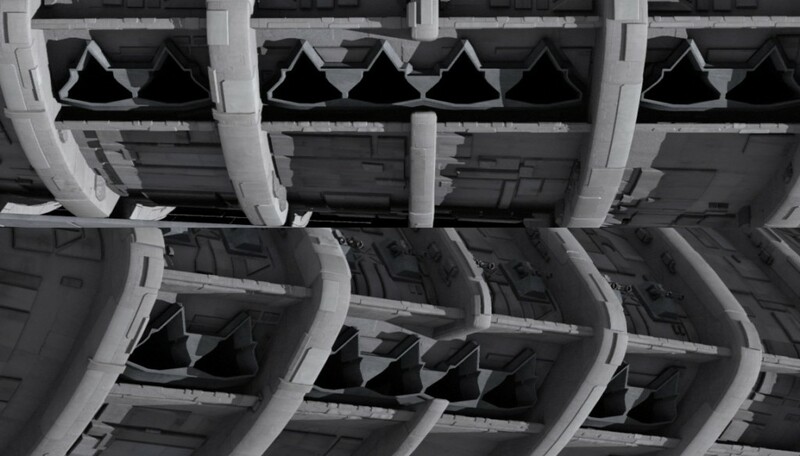 There are also no gaps accounting for the control rooms between launch tubes in the later version (which correspond to armor ribs on the exterior). Here’s a version of the standard eight-tube segment from the series Photoshopped into a reasonable approximation of the Hotstack, taking the exterior arrangement of the tubes into account. If we want to keep the endless vistas, we’ll need to eliminate the middle two elevators. 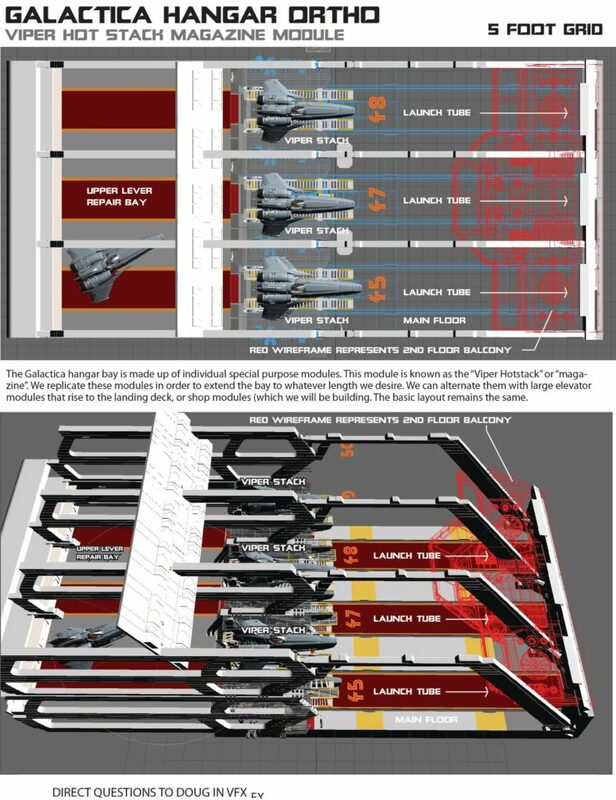 There’s no other way to to take sections of hangar that are 8 Viper-slots wide and make them fit 21+ Hotstacks. That won’t be a problem, because we’ll double-size the inner two remaining elevators to account for the large elevator we see, so gross elevator-capacity remains the same. We can get away with that because we don’t see the inner midsection of the upper deck on-screen, so it could be totally different than the series-era configuration. The space left by the missing elevators also allows us to drop in two shop modules. 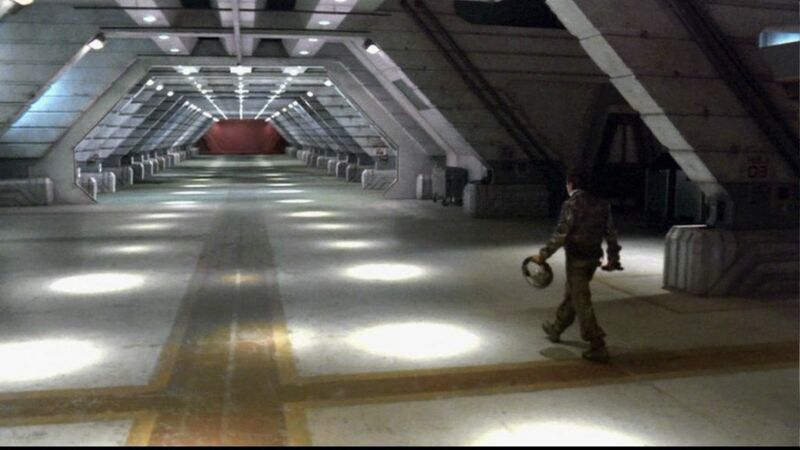 So let’s say that along the inner side of the landing deck are small bays, not unlike the launch tube airlocks on the hangar deck, where a Viper can be wheeled in and lowered into the hangar system, without using one of the large elevators. This also accounts for the barely-seen fifth level that Vipers lower down from. 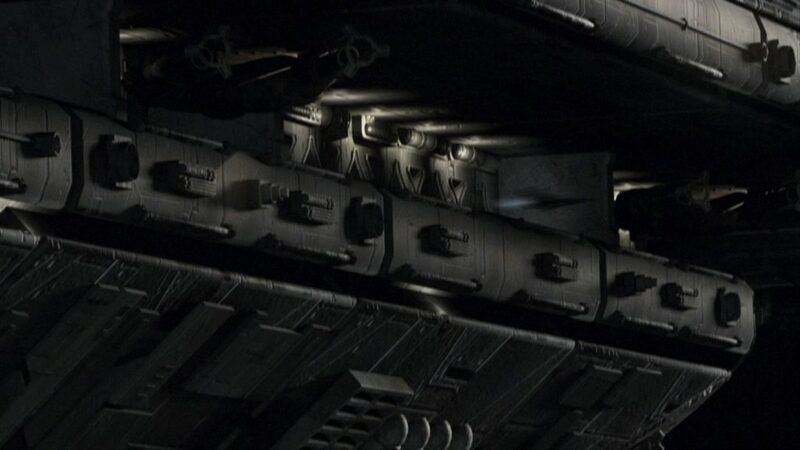 We can also say that the hotstacks under the arms of the flight pod connect to a longer elevator system that allows Vipers to be transferred from one pod to another. 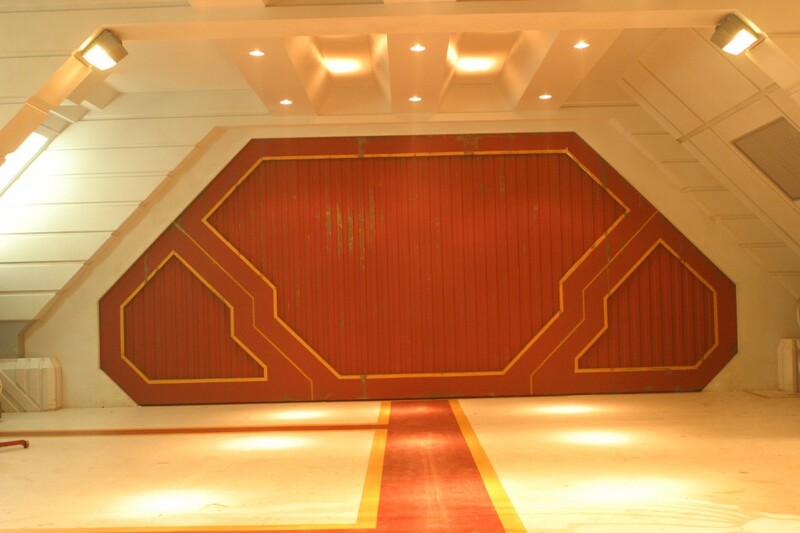 Presumably, when the rest of the hotstack system was dismantled post-war, these elevators remained, perhaps behind retractable panels, accounting for the scene in the Miniseries where all the museum Vipers were moved from the starboard flight pod to the port pod, even though the starboard launch and landing decks had been sealed. I always wondered how they pulled that off. I’m going to just ignore the elevator to the launch tube at the end of the film. While that concept will come in handy for the Pegasus and Valkyrie, in this case, it just changes this from “difficult” to “impossible.” The height just isn’t there. Height is the biggest limiting factor, here. The space between the level of the launch tubes and the landing deck is about three Vipers high. There’s no way to accommodate a five-level stack, or a three-level launch tube elevator, never mind both. Since we barely see it and it’s mostly implicit, I cut out the fifth level of the stack, and have the fourth level open onto the deck. I brought the ceiling back down a bit. And we’ll just have the Vipers go from the stack to the launch tube the old fashioned way. But I digress. We’ve taken care of the center section, but that still leaves two more eight-tube segments, plus the additional storage endcaps I wished into existence last time. I’m also going to get rid of the wider “repair bay” slots that took up the space behind the launch control rooms, since there are no similar gaps in the Hotstacks as seen. The tiny stacks could have stairs or personnel elevators. The tool rooms are also eliminated, since the wall behind the Hotstacks all have tools and worktables set up. I haven’t decided if the eight-tube segments should also have deck-access hotstacks. They could, we wouldn’t have seen them if they were there. 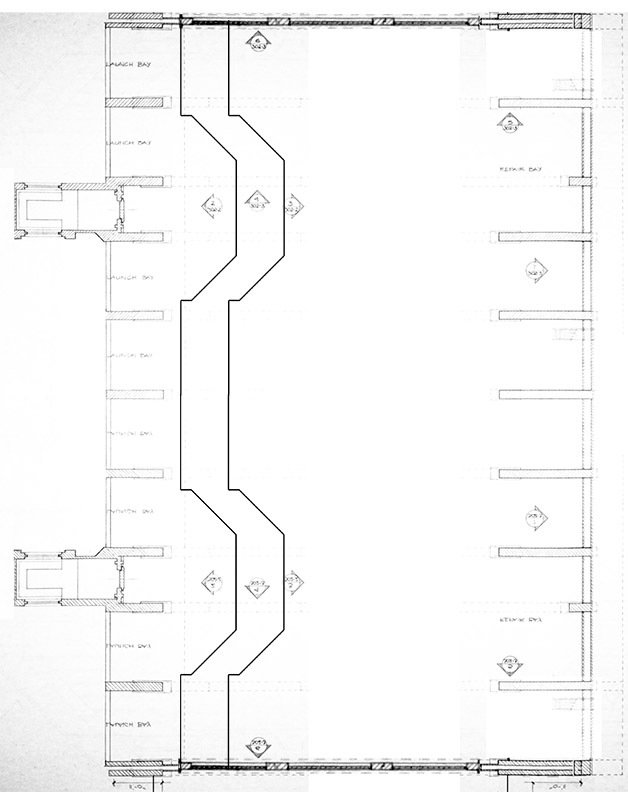 As for the storage sections, I imagine they also use stacks to increase storage area. In this case, they’d be less of a magazine and more of a rack. Well, racks are cool. 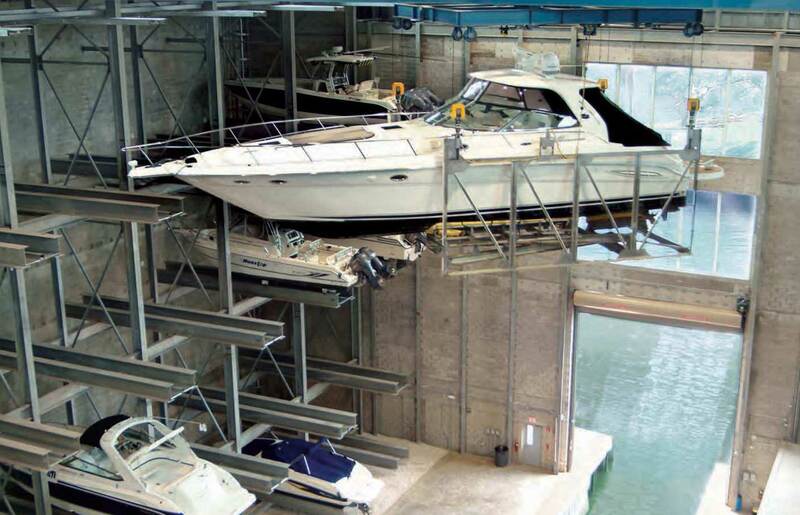 Dry storage boat racks3Source still blow my mind when I see them. The only way I expect to see a boat three floors up is if there was a hurricane. I’ve also rearranged the storage sections at the end of the hangars to better resemble the area Adama passes through at the end of B&C. 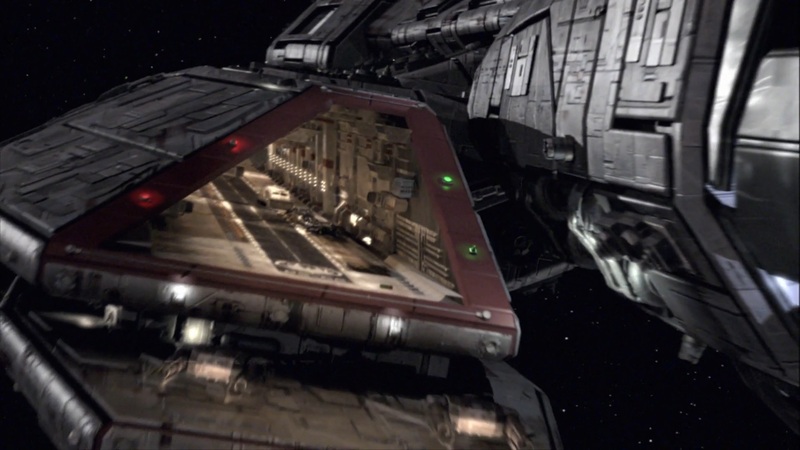 I imagine the second elevator-sized door which suggested a parallel hangar deck opens to a pass-through, so ships can be moved from the storage section to the launch area even when the elevators are in use. 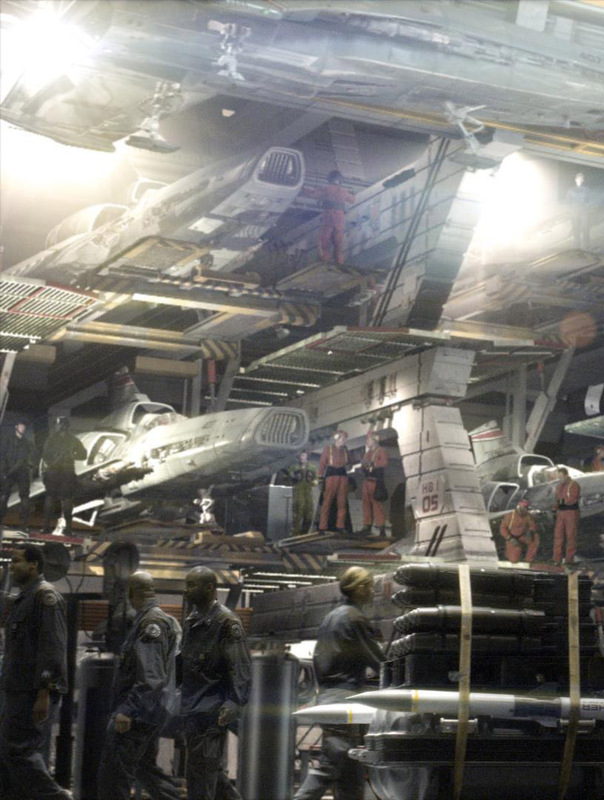 Here’s a cross-section of how I envision the hangar bay. It just barely fits in the flight pod (or just barely doesn’t, but it’s a TV vehicle. “Close” is good enough. I’m just glad I didn’t have to rotate anything 36 degrees counterclockwise to get it to fit). Here it is, along with my interpretation of the series version for comparison. The Hotstack increases the capacity of Galactica considerably, though perhaps not by as much as you’d expect. There are deck-level berths for 66 Vipers4I shrank the Mark IIIs in this illustration so they’re the same width as the launch tube, which actually makes them slightly shorter than the Mark II in my layout, and 6 Raptors. Assuming they’re all stacked three high, that’s nearly 200 Vipers and 20 Raptors per pod, or 400 Vipers and 40 Raptors as a low-end total estimate (compared to an estimate of 160 Vipers and 40 Raptors for the series version, which was the high-end estimate). And that’s a conservative estimate. 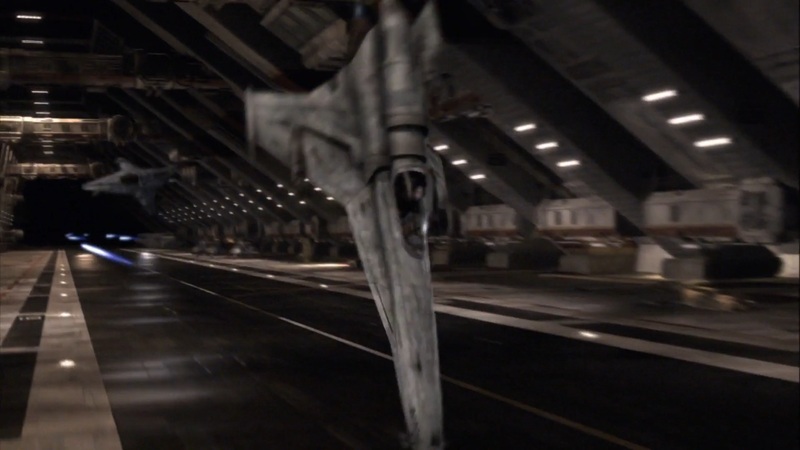 Blood and Chrome seemed to indicate the war-era Colonials had no problems with storing ships outside of their berths, on the hangar deck or even exposed to space on the landing deck, even when they aren’t on the run and undercrewed. If you filled in all that floor space with extra Vipers, you could increase capacity even more, never mind the possibility of top-deck parking. I also have no idea what should go behind the door to the shop modules (indicated by the “?” I put there), so there could be even more ships crammed in back there. 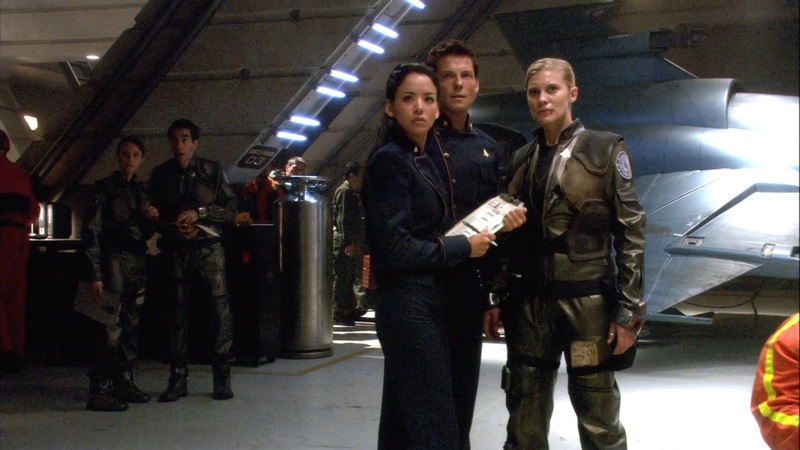 There are aspects of this that make sense (the battlestars, like a lot of science fiction spacecraft, seem to have a lot more room than they need for the amount of crew they had, so tripling the flight crew still wouldn’t make it cramped). 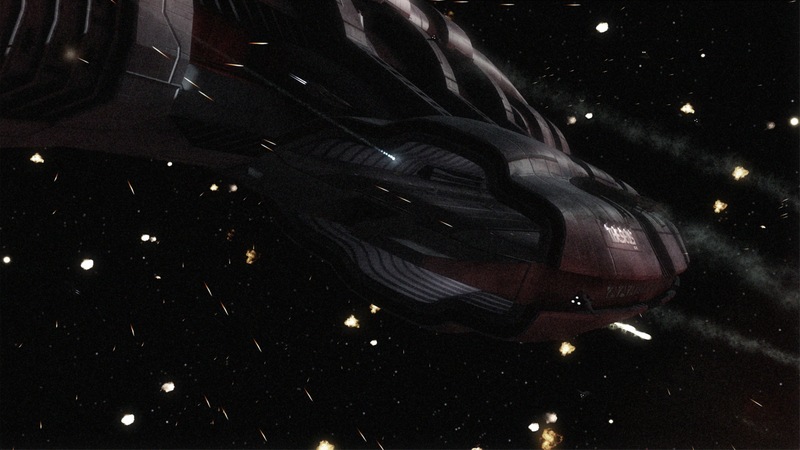 The series-era Cylon Basestars had, depending on the model, either 864 or 434 launch slots for Raiders, implying they could carry well over a thousand fighters if they had any internal fighter storage. 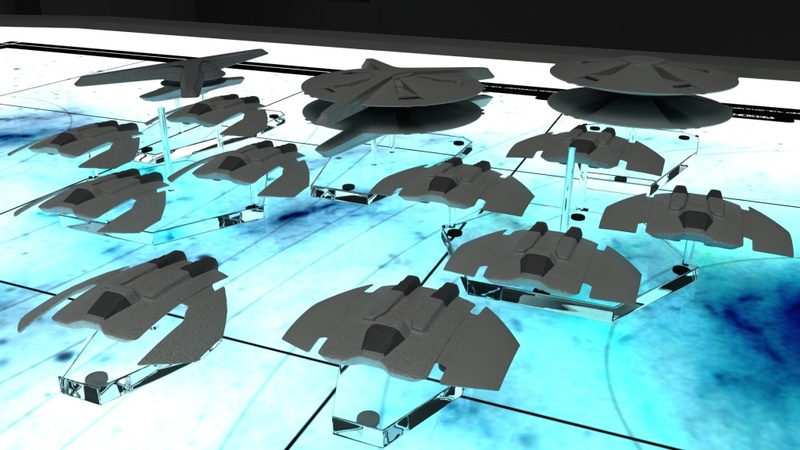 If the war-era Baseships had a similar number of raiders, the Colonials may have needed to pack a greater number of fighters into their battlestars. On the other hand, there isn’t a lot of runway space for all those Vipers to land on. 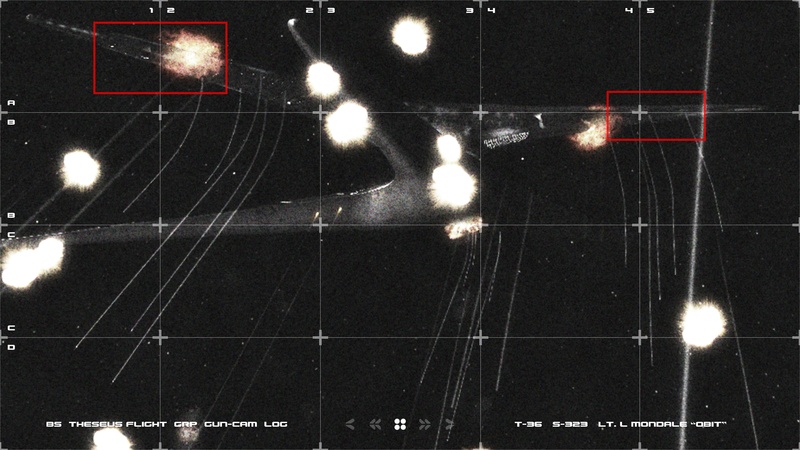 The combat landings we saw in nuBSG were very chaotic, and it was a shock that more Vipers didn’t smash into each other skidding to a stop than were shot down. I’m not sure the ship has the physical deck space to accommodate over two hundred fighters landing at once. 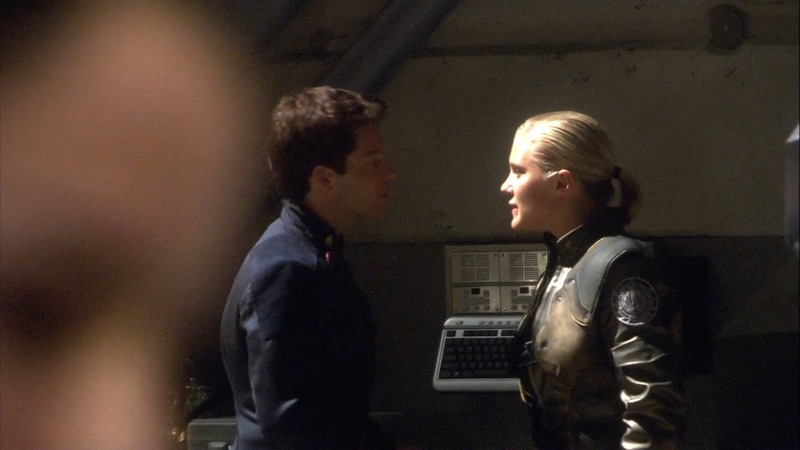 The tactics implied by a Hotstack-equipped Battlestar seems to be a far lengthier encounter than anything seen in the parent show (or, for that matter, in B&C). The B&C model makes more sense if it’s built for long battles, where Vipers are constantly landing during an engagement, to be replenished and relaunched because the fight has actually gone on long enough for them to run down on fuel, weapons, or air. Also, the arrangement of launch tubes and elevators is far more straightforward with the nuBSG approach. Despite the in-universe rationale, it still looks a lot more like B&C was an expansion of the original design, rather than the series version of the ship being stripped-down. Still, it is what it is, so I’ll try to speculate on why. 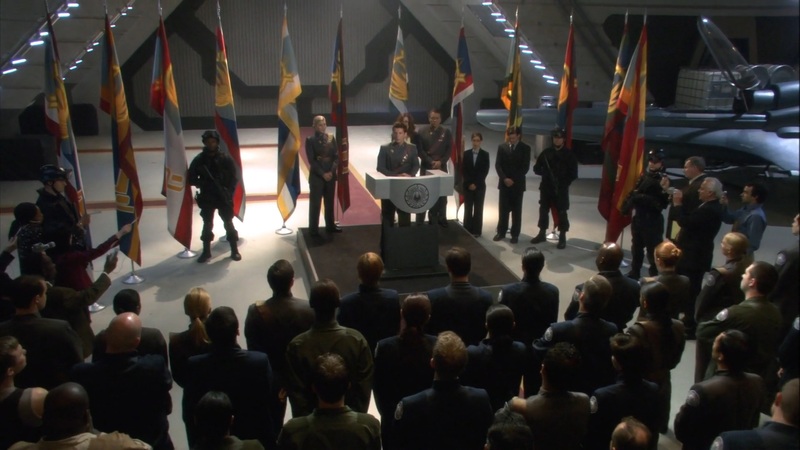 The Cylon War came as a surprise to the Colonials, and the Battlestars were built quickly, specifically to combat the Cylons. 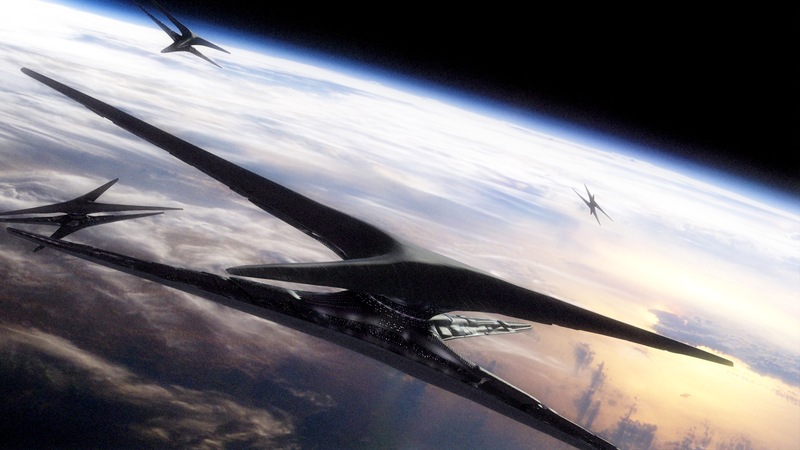 Presumably, it took time for the Cylons to design and construct their own forces, so the first Basestars may have appeared while Galactica and the other Battlestars were still being built, necessitating on-the-fly redesigns of the ships to counter the emerging Cylon tactics (in addition to whatever revisions they were making on their own, being a heavily-computerized society designing their first hand-operated spaceships). 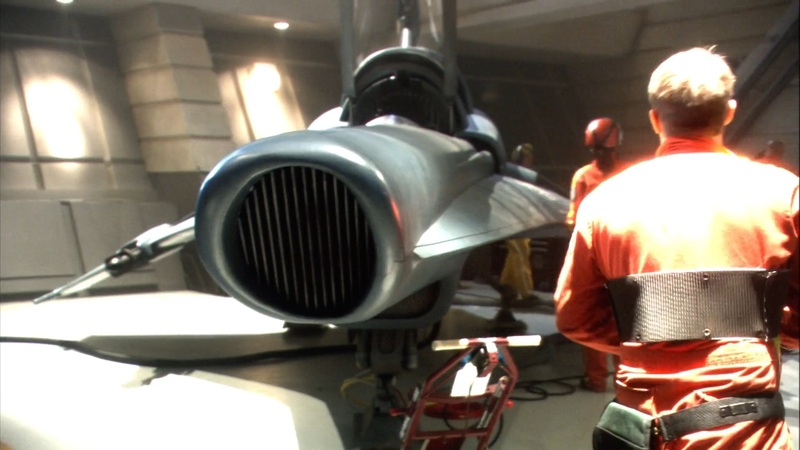 I’d propose the Galactica was designed with a hangar system more like what we saw in the series, perhaps with two levels of Viper storage instead of the full hotstack, and the new requirement for a larger fighter wing led to it being widened and expanded while under construction. 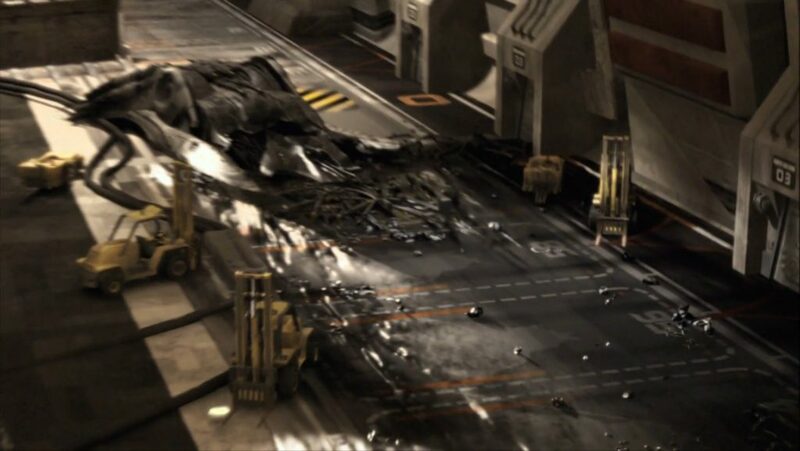 After the war, when they no longer need so much cannon fodder and could go for quality over quantity, the hangars were rebuilt to a stripped-down version of the original design, which fit in better with the structure of the ship, anyway. There is some other precedent about the ship being redesigned during construction: the engineering section is very similar to the TOS Galactica design, with four extra nacelles bolted on. Perhaps the TOS version was going to be the next big thing in Colonial spacecraft, but was revamped during design and construction until it came out as the B&C version. 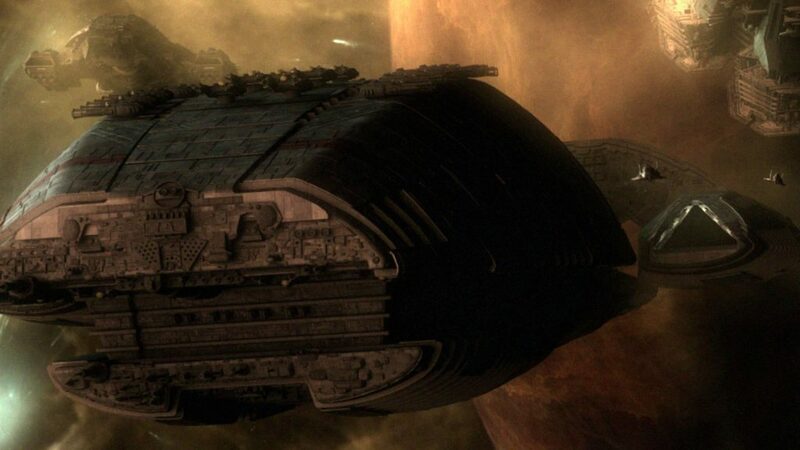 While the hotstack design is great for a lengthy battle or siege, if a Battlestar had to escape in a hurry, if would never be able to recover all of its Vipers within a couple of minutes. 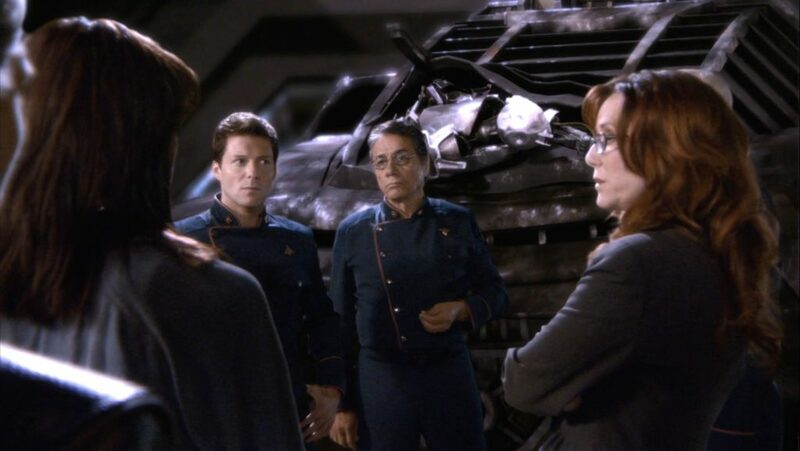 Now, you could argue that, during the series, Galactica and Pegasus were in a unique situation, and the Colonial military wouldn’t have intended for their ships to end every single encounter with the enemy by retreating from an overwhelming force. 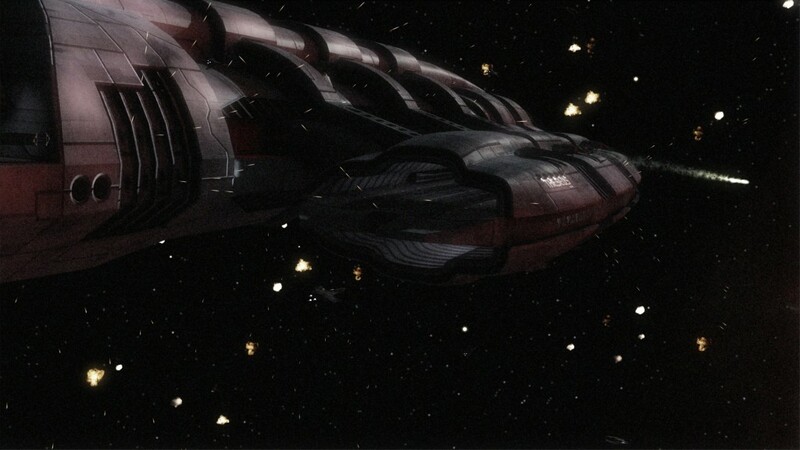 However, the fact that the latter-day Battlestars were even capable of doing so suggests the during the Cylon War, something happened that made planning for hit-and-run attacks and quick withdrawals worth incorporating into Colonial ship designs (consider that Pegasus has only 40 launch tubes per pod, same as Galactica, but has more than double the landing deck area, implying quickly landing a lot of fighters was a more important goal than quickly launching them). My guess would be that there was a disastrous defeat for the Colonial forces, where a Battlestar had to jump away, leaving its fighter force behind. Or, if you wanted to be really cruel, a Battlestar was destroyed, and one of its sister ships tried to take on her fighters but didn’t have the space and had to deliberately leave them behind in a slower-paced rout. 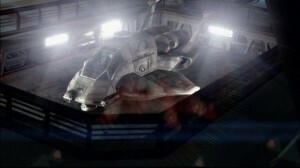 The long-term solution would be switching to a quality-over-quantity doctrine for fighters, but short-term, you might expect to see a “recovery ship” designed to join Battlestar Groups that had the opposite trade-off from Galactica; far more landing space than she needed for the number of Vipers she could carry. Her role in large-scale engagements would be specifically to give fighters someplace to land just for the duration of an emergency FTL jump. While I’m here, I’ll put down another thought I had. 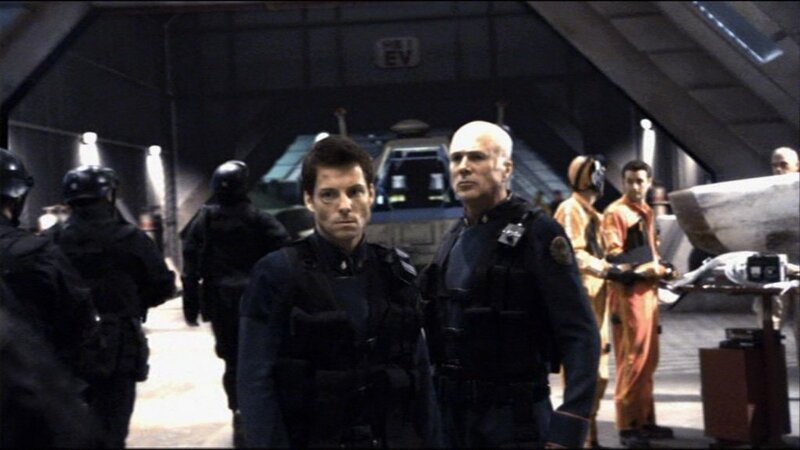 I mentioned near the beginning of the post that there were two version of Galactica seen during B&C. While I have an opinion about which one is correct, I don’t have an issue with the other version being a design that also existed during the war. 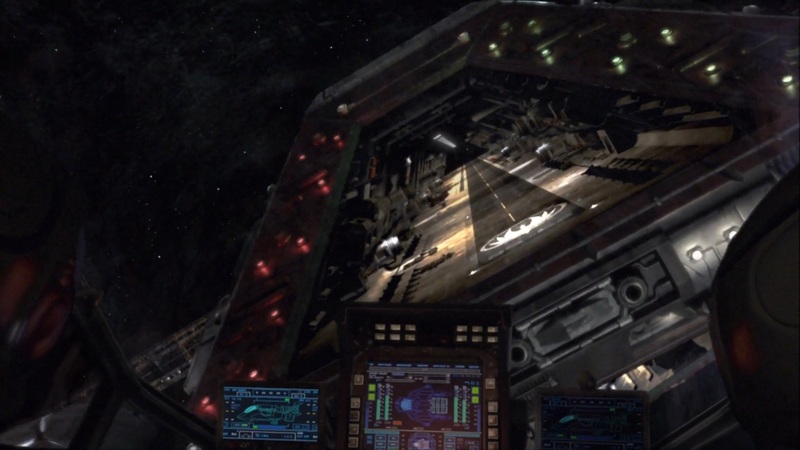 In both cases, the major differences between the B&C versions and the series Galactica is a full set of armor plating, and many more large gun batteries. My take is that these guns are less reliable and have a slower rate of fire than the series-era version, so that while the B&C Galactica looks imposing, and can deliver one hell of a salvo, in terms of overall rate of fire she at best matches her future equivalent. Perhaps the Columbia, seen in the flashback sequence in Razor, was the first Battlestar to be refit with a smaller number of more effective batteries (perhaps before the batteries were fully capable of picking up the slack, given she was overwhelmed and destroyed by Cylon missile barrages). 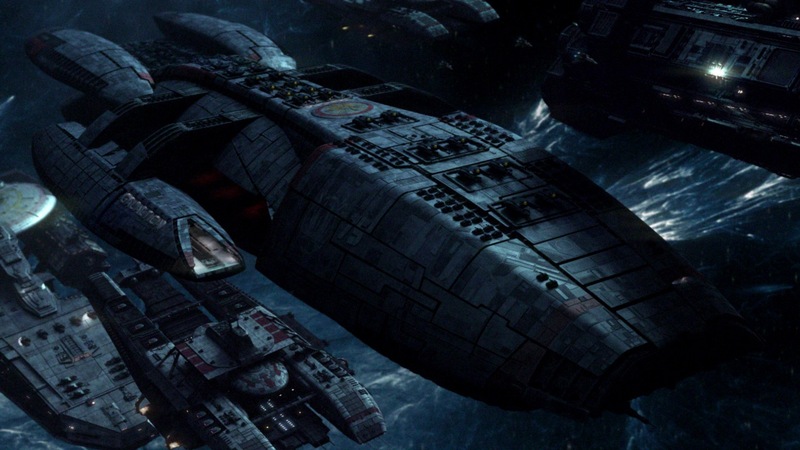 Likewise, given that the Galactica-type5Okay, real dark-horse opinion, here: I consider the nuBSG ship to be Jupiter-class, as asserted by one obscure behind-the-scenes book. I like the idea of Colonial Battlestar classes being named for deities. 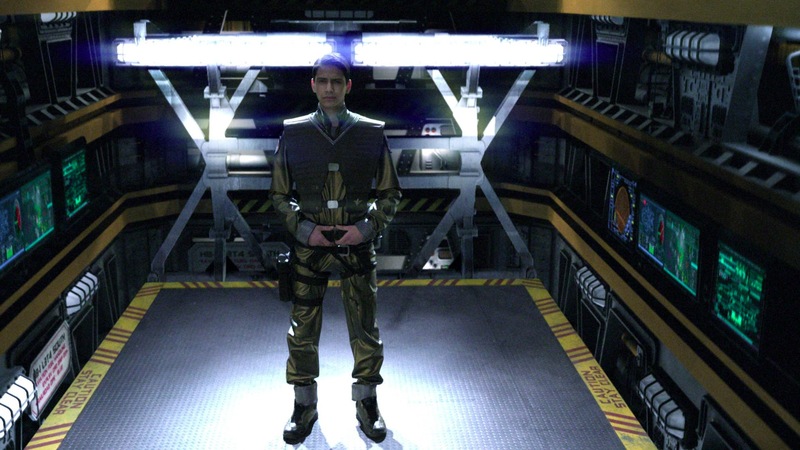 ships that were still in service in the nuBSG era had patchwork armor just like the series-era Galactica, that clearly wasn’t done because of the decommissioning, but was a standard modification. 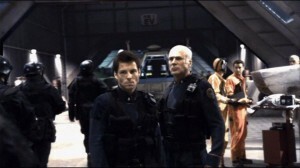 I say the war-era Battlestars were overbuilt, and much of their armor was later determined to be superfluous (perhaps because the hull underneath most areas provided adequate protection, and/or the newer, faster gun batteries created a flak barrier thick enough that hardly any Cylon missiles were expected to score a hit at all), so it was removed, making the ship faster and more maneuverable. 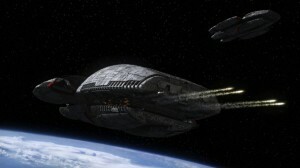 I think one-on-one, Admiral Adama’s old warhorse Galactica could beat Commander Nash’s brand-new Galactica. Adding in the fighter compliment would change things, since the B&C version has such an advantage in numbers, but ship-to-ship, I think the Galactica was improved over her lifespan, rather than becoming less effective. She could still be a “white elephant” in her latter days, but as it turned out Galactica being too much battlestar as opposed to something leaner probably saved humanity. 1. 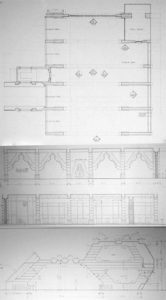 ↑ I started drafting this post and making the diagrams long before I finished and posted it, and I cannot for the life of me remember how I deduced the size of the large doors from the regular-sized ones. Possibly from the height? 5. ↑ Okay, real dark-horse opinion, here: I consider the nuBSG ship to be Jupiter-class, as asserted by one obscure behind-the-scenes book. I like the idea of Colonial Battlestar classes being named for deities. 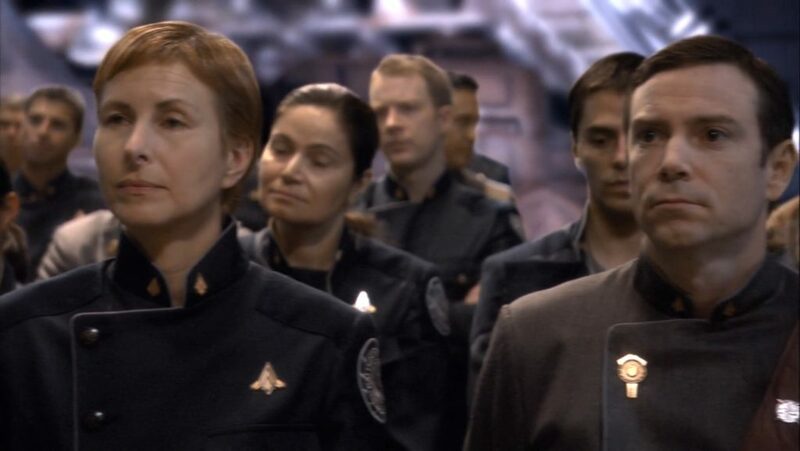 Perhaps someday I’ll go into my elaborate theory on how Avatar takes place in the universe of the new Battlestar Galactica. 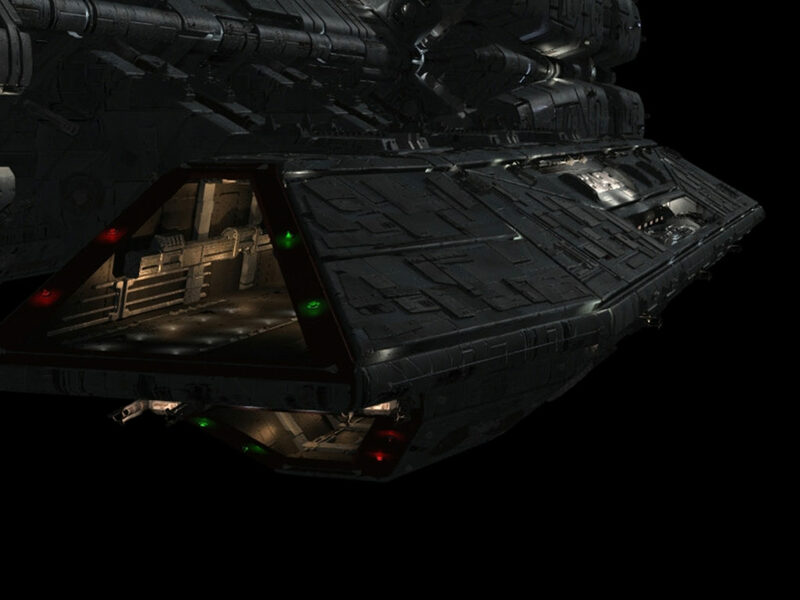 The models from Battlestar Galactica Online render surprisingly well. 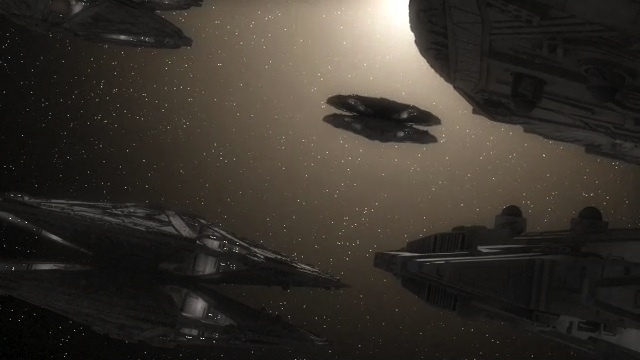 Aside from the foreground Basestar, you can hardly tell the ships are video-game quality. 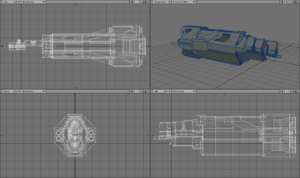 Maybe I’ll go on another expedition to pull more models out from the game’s files. That’s pretty much all there is to this image. I was applying the texture maps to the model, saw how nicely the light played along it and how well the little window-things stood out, and decided to instance out a bunch more Basestars and add some fill light. 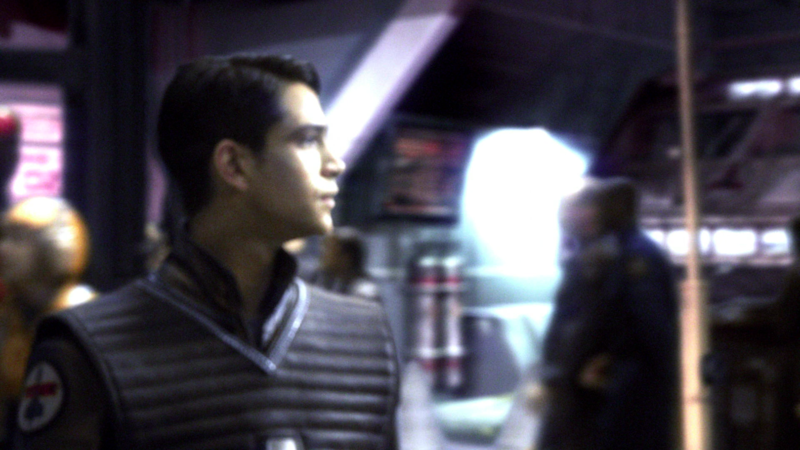 It definitely helps that, in the show, the Cylons never seemed to care much for the orientation of their ships. There are a few places were they overlap in the frame, but I checked, there weren’t any intersections. The random seed just doesn’t have a good eye for composition. 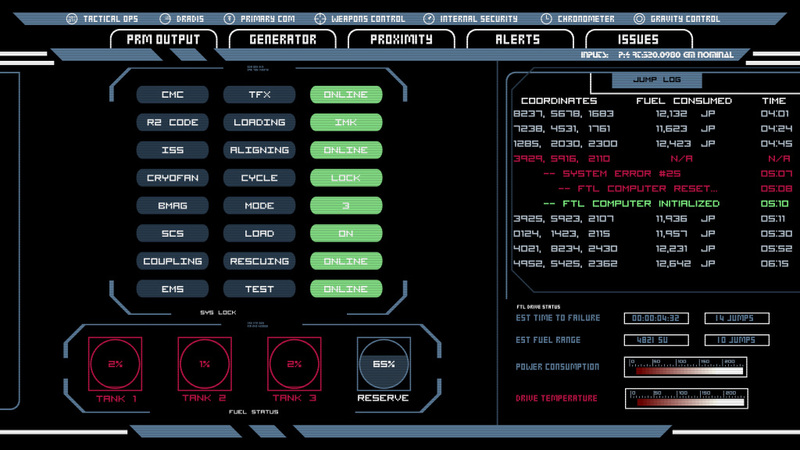 A while ago, I made a set of icons for the DRADIS displays from the new Battlestar Galactica. 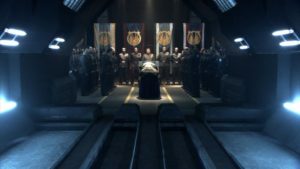 Another artist contributed a recreation of the actual monitors, and I built on both to make computer screens for some cutscenes in the fan-made BSG video game, Diaspora. 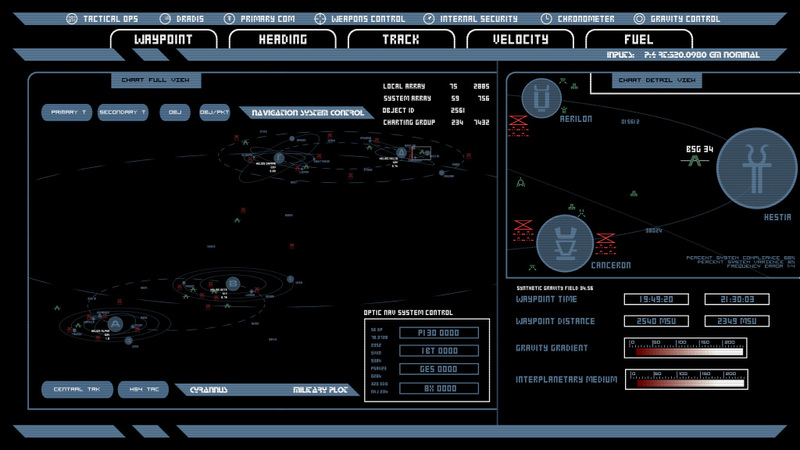 I figure sooner or later, I’ll probably need some more BSG computer screens using the design language from the Pegasus, rather than the Galactica. I’ve had some spare time recently, so I decided to recreate the DRADIS screens from the Pegasus. 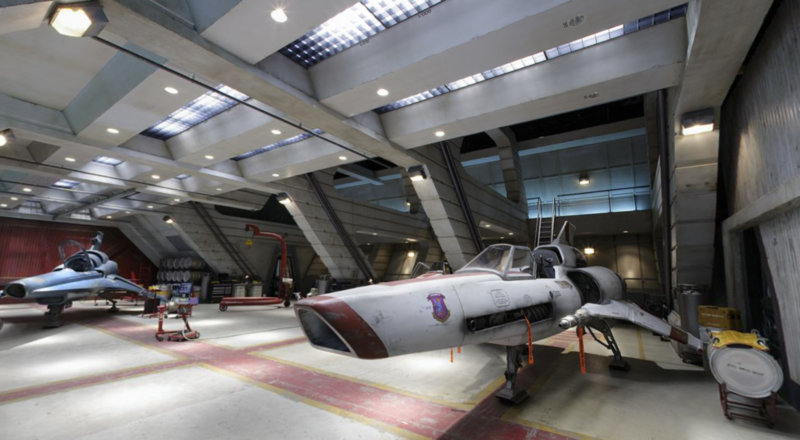 Buildings and vehicles in movies tend to have discrepancies between the exterior and interior, thanks to the realities of filming. It’s difficult to build an exterior mock-up to full scale, or construct an interior set to perfectly match the shape of a model. 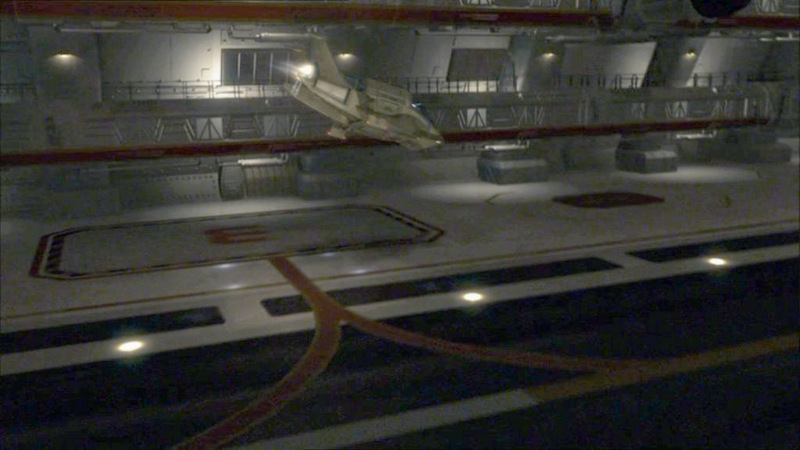 The Battlestar Galactica from the 2003 remake is a rare exception, and after some examination of it, I was surprised by how much effort went in to matching the hangar deck set with the design of the exterior of the ship. 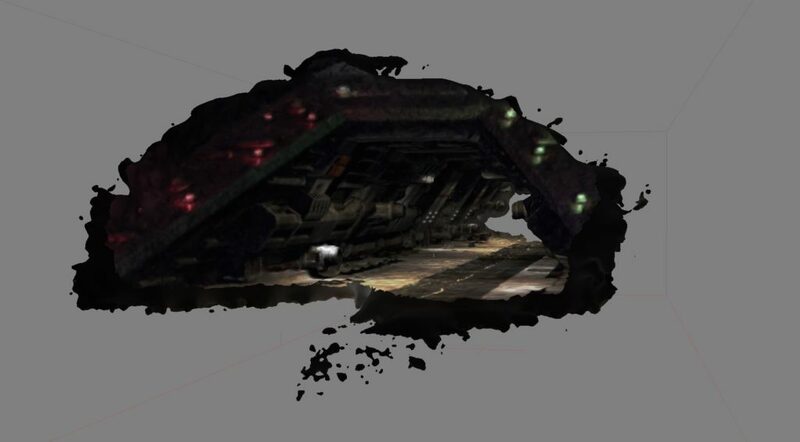 Years ago, I built a rough 3D model of the Galactica hangar, based on the model used for set extensions on the show, and I wanted to complete and expand it at some point. 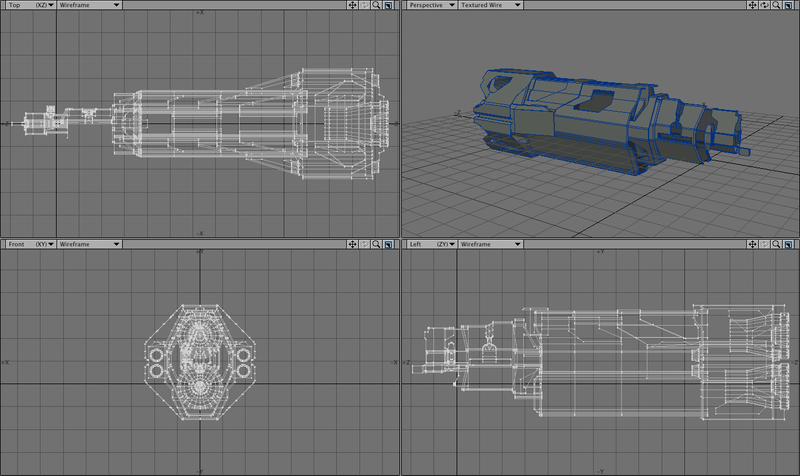 I began looking at the design of the ship in more detail in to start to work out a plan. 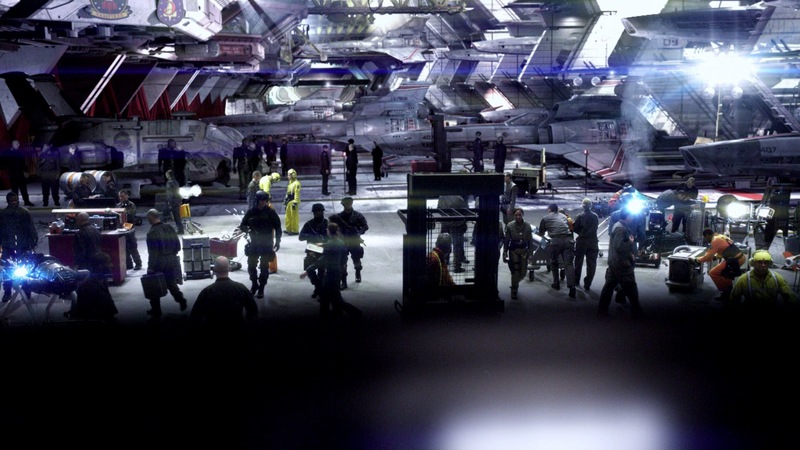 A couple months ago, I found Lee Stringer’s Flickr, which included a bunch of photos taken of the hangar set, Viper Mark II prop, and the construction blueprints for both that were apparently taken during pre-production of the 2003 miniseries as reference for the VFX team to build their 3D versions. 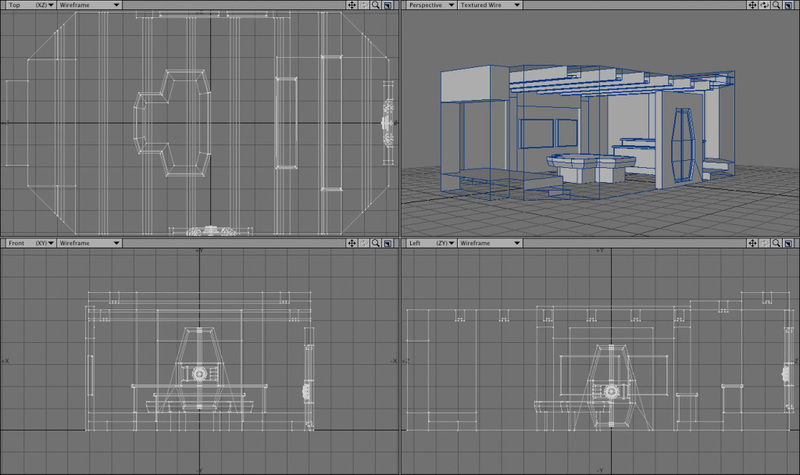 This was the motherlode, and I found that I’d have to restart my model from scratch once I compared it to the actual set drawings. I don’t quite have the time to knuckle down and actually remake my hangar deck model yet based on this new information, but I can write up all the research and extrapolation I did rather than just keeping it in my brain and hoping I remember it all when I get around to it. I also intend to do posts like this (with increasing amounts of extrapolation) for the hangars of the Blood and Chrome version of Galactica, the Pegasus, the Valkyrie, and the Theseus from “Diaspora,” the fan-made BSG-themed game. I’m going to start with the physical set and CG set extensions, then the exterior model, and then synthesize the two together, including a few areas that logically should exist, but weren’t explicitly seen on the show because they can’t go rebuilding their biggest set every week to make the minority of fans watching with a pause button and a slide-rule happy. 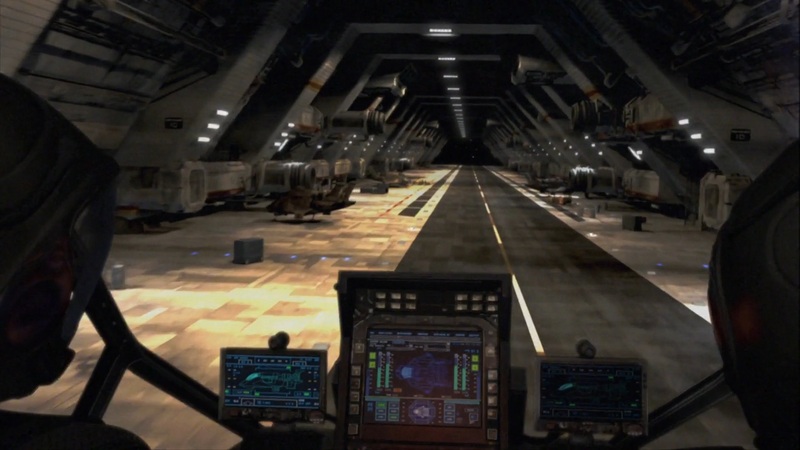 The set of the Galactica hangar deck is a standard segment, consisting of four launch tubes with a control room in between them on the outer side. On the inner side is a series of three semi-enclosed areas (two behind launch tubes and a wider one behind a launch tube and the control room) and a tool room. 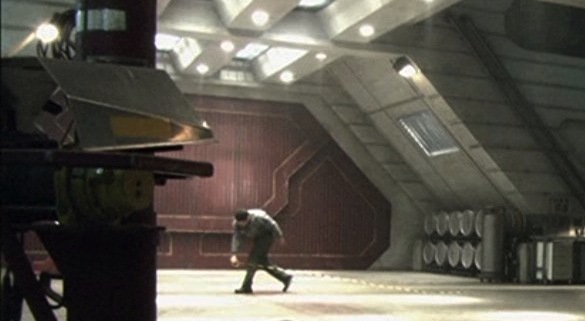 The tool room has a door leading out to the hangar deck, and another door on the inside, apparently connecting to a corridor. The Large Door was replaced with a different, more elaborate large door after the miniseries. 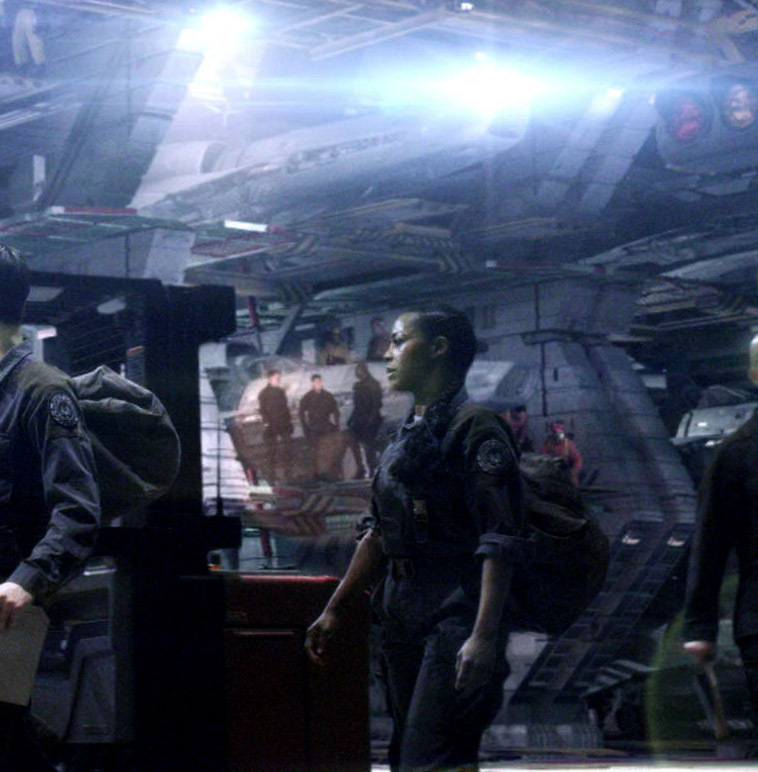 Interestingly, the miniseries door continued to appear as a CG element in set extensions for the rest of run of the show, even appearing once alongside the new physical door. 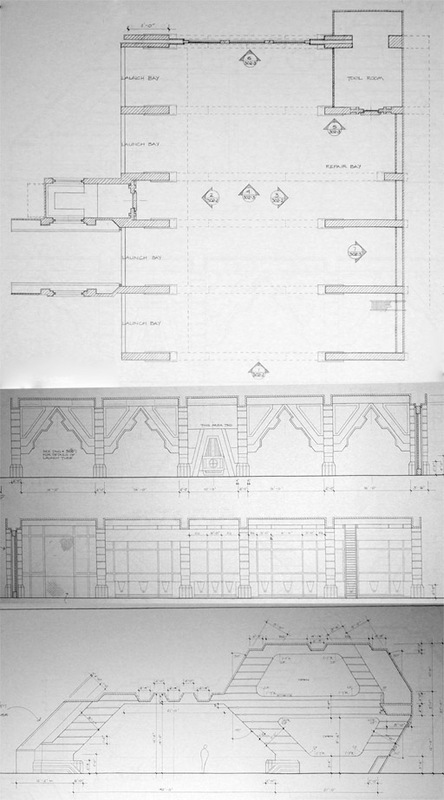 Both versions of the large door appear to be made of three interlocking segments, but they always move as one solid piece when they are shown retracting into the ceiling. There is one exception. In Blood and Chrome, the miniseries-style door was used for the Galactica and the Osiris hangar decks. 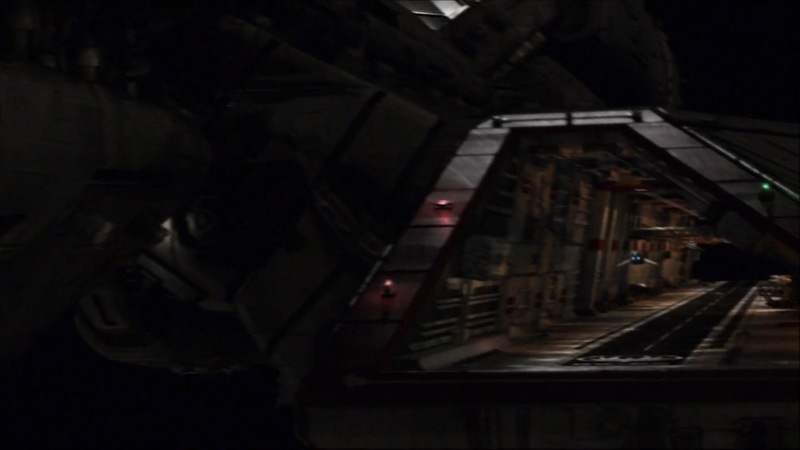 While Galactica continues the tradition of showing the door as a single solid piece, when Adama’s Raptor launches from the Osiris, you can just barely see the top piece of the hangar door open first, followed by the lower corner pieces retracting to the sides. 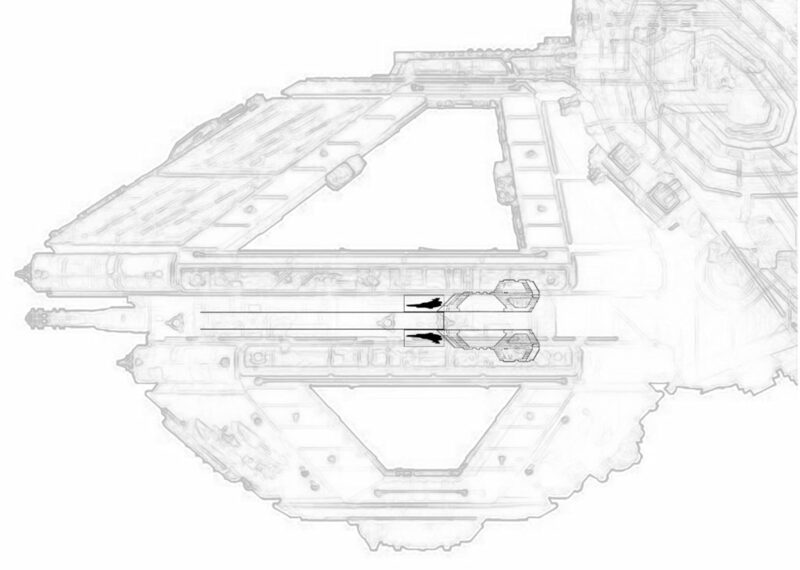 The original large door has enough room to retract into Galactica’s bulkheads if it split into three pieces, though the second door would cut through the corridor access in the tool room if it retracted in three seperate segments. The landing deck of the flight pod has a series of regularly-spaced aircraft elevators. These elevators have taxi-lines connecting them to the runway, and have two square… things… in between each elevator. There is also a dark grey line outlining the elevator. This is a railing that raises from the deck at certain stages of the elevator’s operation, to prevent hapless deckhands from falling in. This was inconsistently depicted during the show. The set contains one half of an eight-tube cluster. It’s ambiguous if there are two tool rooms per cluster, but I’m going to go with there just being the one, since it gives more room for Vipers and Raptors, and while having one in each cluster is logical (no sense having to go over hill and dale to get a wrench because a Raptor is being launched and you can’t cut through the elevator), two seems redundant. Each cluster is bookended by two aircraft elevators, including the outermost ones. That, along with the occasional presence of a bulkhead suggests there is an additional length of hangar, extending beyond the launch tubes and elevators. 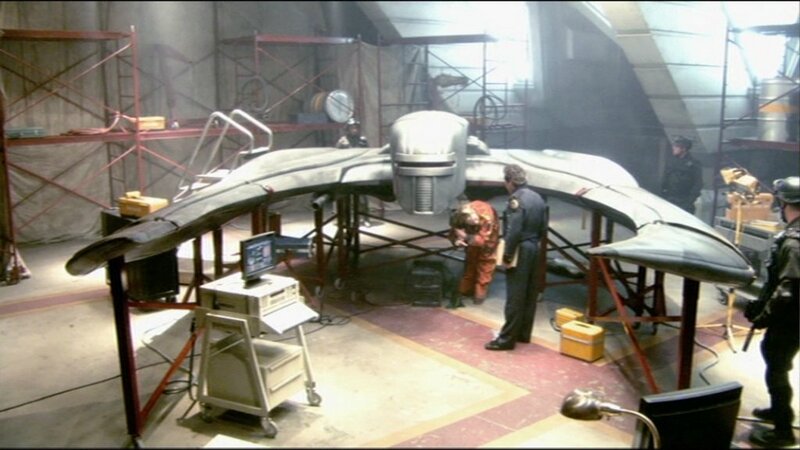 Budgetary restraints being what they are, the set representing it still had the launch tubes, though they were usually kept in shadow or off-camera during these scenes to downplay it. The shape of the flight pod suggests that they’re half-sized segments, since otherwise they’d be poking out of the hull as it tapers. The simplest possibly would that the launch-tube side of the additional hangar area just mirrors the inner side, with Viper cubbies and a second-level walkway. 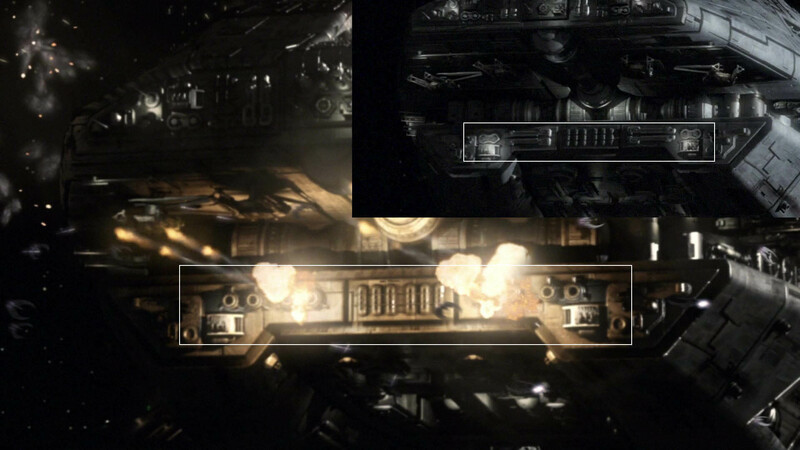 Another possibility is suggested by Blood and Chrome, where a couple of shots show a large door identical to the ones that lead to the aircraft elevators on the outboard side of the hangar. Apparently, they lead to more storage, since a later shot shows a pair of Landrams parked behind them. 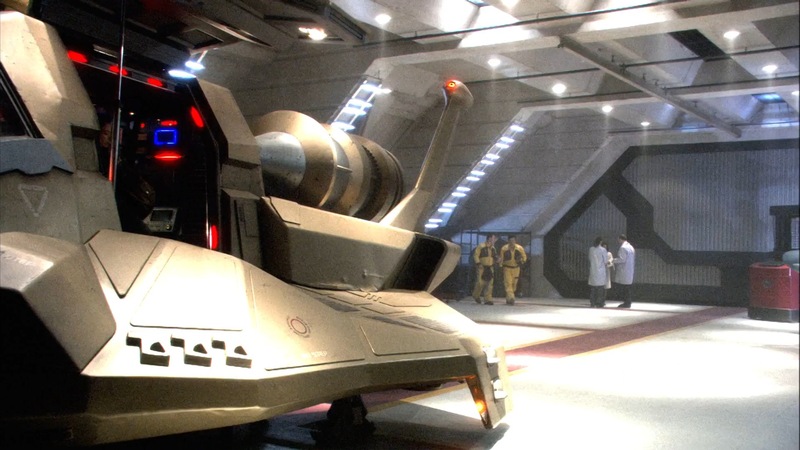 There are a couple of different way these endcaps might sprawl out behind those doors, such as having elevator-sized garages, or even a few additional identical sections of hangar. I’m going to go with the most capacious option, since there are a lot of Vipers, Raptors, Landrams, and Forklifts that need to be stowed. 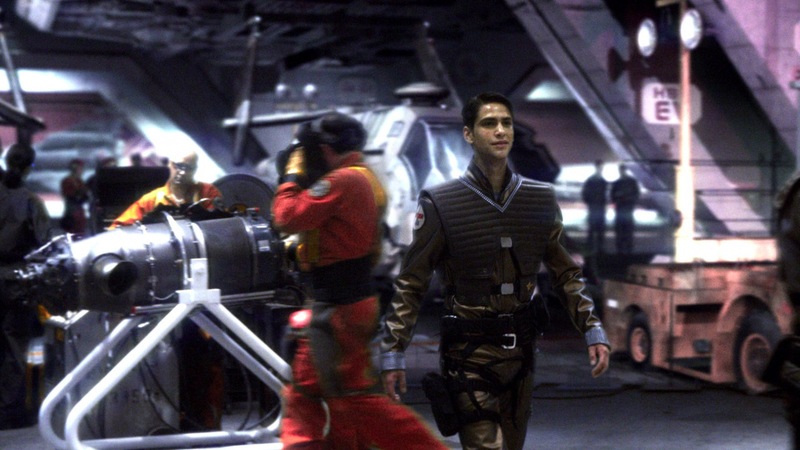 And who knows where they put those shuttlecraft that are too long for the elevators and too tall for the hangar deck. Here’s a layout of the Galactica’s port hangar deck, based on everything we’ve gone over so far. 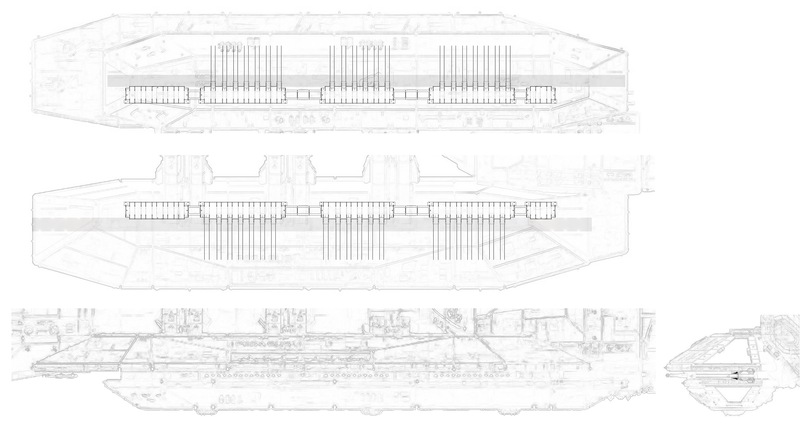 While I was drafting this, before I finished the illustrations, Lee Stringer added another image to his Flickr (hat-tip to Galactiguise for pointing it out) showing a cutaway of Galactica’s flight pod, explaining more artistically how the hangars, elevators, and launch tubes fit into the exterior model of the ship. Incidentally, the elevators are numbered 1 through 6, from forward to aft. There are wayfinding signs throughout the hangar (such as HB1/04 or HB9/RB or HB1/34), but I’m going to punt dealing with them until I actually model the hangar, mostly because I can’t figure out how to make them consistent. Either HB# refers to the flight pod, in which case there’s only an HB1 and an HB2, and no HB9, and the second number goes up to 40-something or so, or HB refers the the clusters between the elevators, in which case the second number should never go above 8. And the second possibility leads to the question of whether the port and starboard pods share numbers, so there’s an HB1 in each, or if the starboard pod starts with HB7 and continues to HB12. I’m leaning towards the first option, if only because that’s what the leading zero in the second number but not the first suggests. In the miniseries, Galactica’s starboard landing deck has been enclosed and converted into a museum. As part of the conversions, the starboard launch tubes were rendered unusable. This apparently was never repaired, and the starboard hangar deck was eventually used exclusively for civilian housing and, probably, Joe’s Bar. In the second season of the show, the Battlestar Pegasus joined the fleet, and was revealed to have an on-board Viper factory. 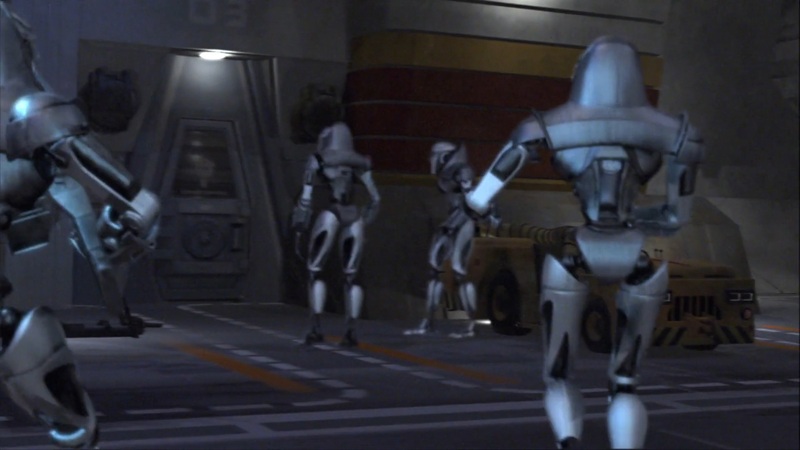 In season three, Pegasus was destroyed in a suicide mission, after off-loading her Vipers and most of her crew (and probably a ton of other useful supplies and weapons, given that no one ever complained about a shortage of nuclear weapons again). Considering the number of Vipers Pegasus already had on-hand, combined with whatever replacements they built after joining the Fleet, there’s only one reasonable conclusion: For the rest of the run of the show, Galactica had more Mark VII Vipers (and, probably, Raptors) than she could carry, especially with only one working flight-pod. 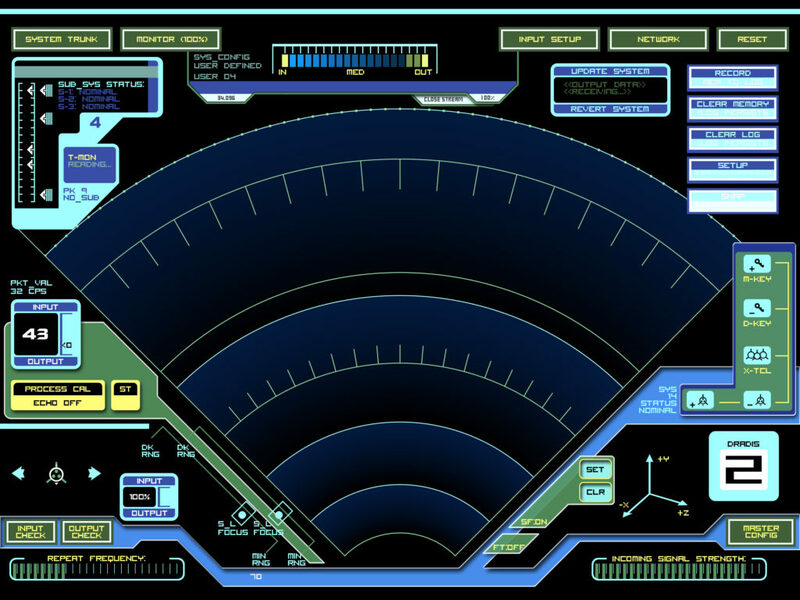 Behind-the-scenes information says that the Mark VII was harder to fly than the Mark II, since it was designed with computerized features that were removed after the Cylon attack. 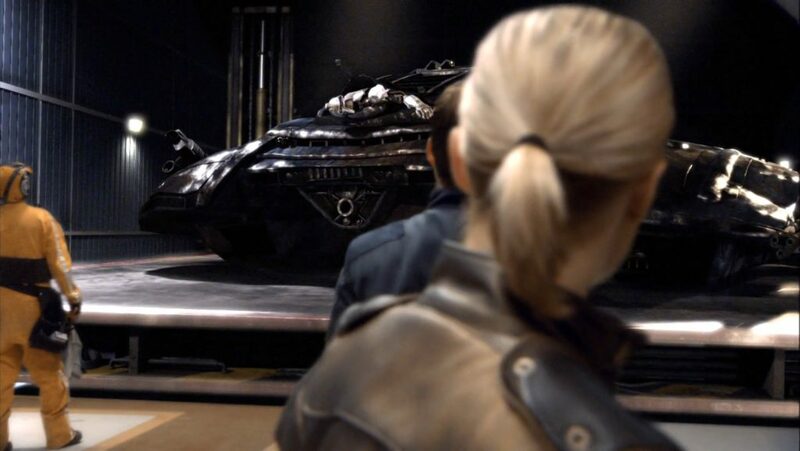 So, that would explain why Galactica continued operating the Mark II Vipers even when there were enough newer Vipers around to replace them. 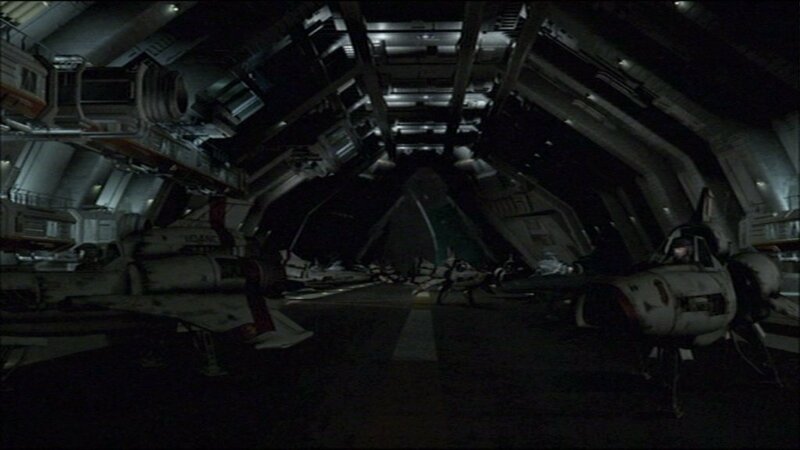 I’d assume the remaining Vipers and Raptors that didn’t fit on the hangar were either mothballed elsewhere on the ship or in the fleet or were disassembled for parts. 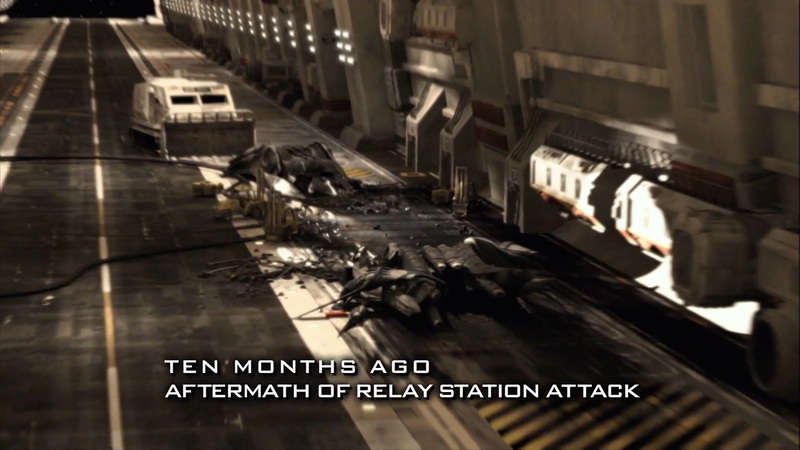 In the Season 4 episode where Galactica donates some Vipers to the Rebel Basestar for their attack on the Cylon Resurrection Hub, Starbuck mentions that half of their planes are with the Baseship, leaving them with 40 “birds,” which may or may not refer to both Vipers and Raptors. There didn’t seem to be much Raptor attrition after New Caprica, and about 16 Raptors jumped out of the starboard landing deck during the assault on the Colony in the finale (the camera move was very abrupt, so it’s hard to be sure, plus there may have been more Raptors that were left with the Rebel Baseship or launched more traditionally from the port pod), so let’s have that as a target, giving us a goal of at least 16 Raptors and between 64 and 80 Vipers in one pod. 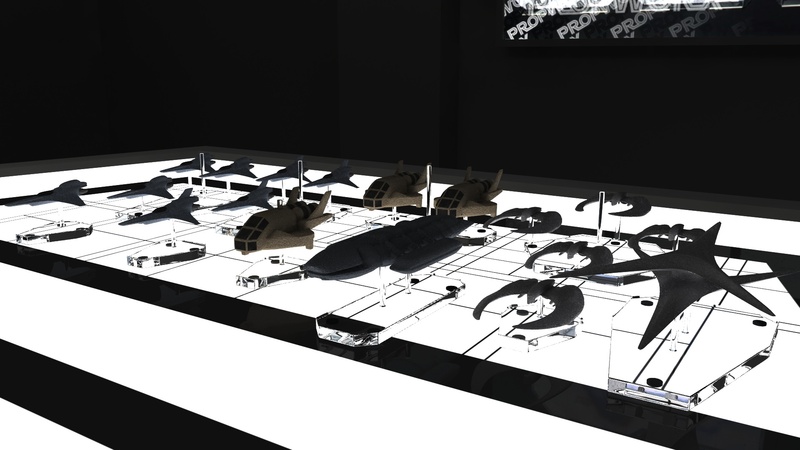 I began playing with my conjectural hangar layout to see how they might fit in. I tried to find permanent “parking spaces” for each craft, assuming that having them haphazardly floating around the deck isn’t how they’re supposed to be stored long-term, and was just an artifact of Galactica having constant flight operations. 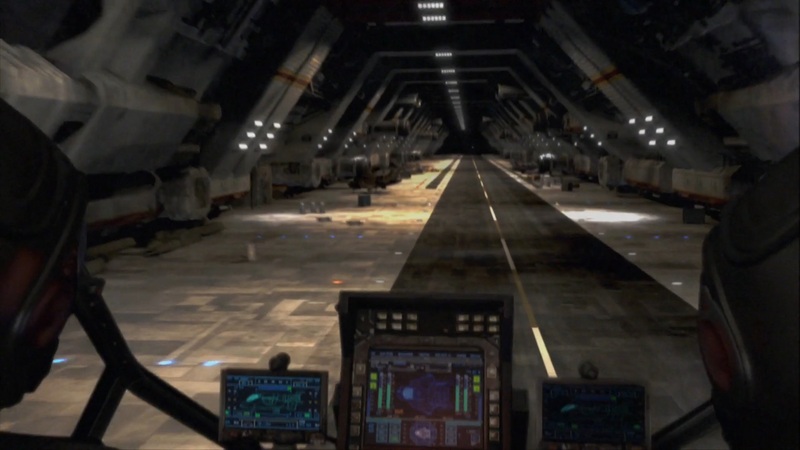 And given how often we saw the port hangar deck empty or nearly so (including Starbuck’s Earth-Viper apparently getting it’s own sealed section, because it was too creepy to let anyone fly), leaving some wiggle room so some segments could be filled past capacity while others were emptied makes sense. 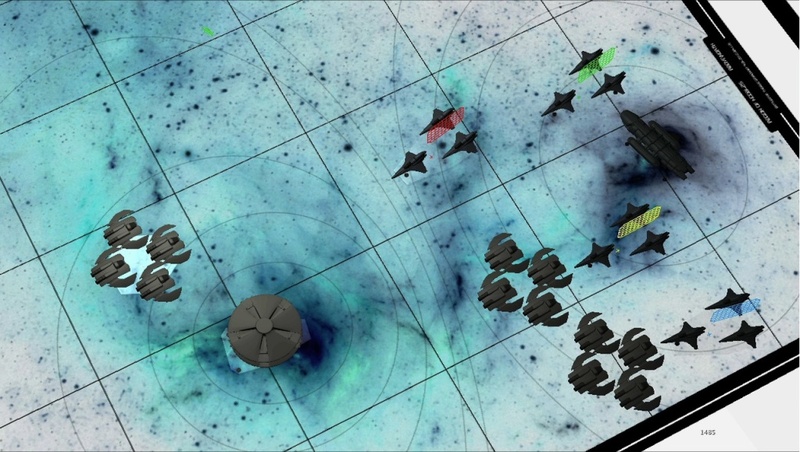 This possible layout has 79 Vipers, 21 Raptors, and 8 Landrams, which are close enough to the canonical figures that I’ll say it’s a reasonably accurate extrapolation of Galactica’s maximum air wing, operating one flight pod. 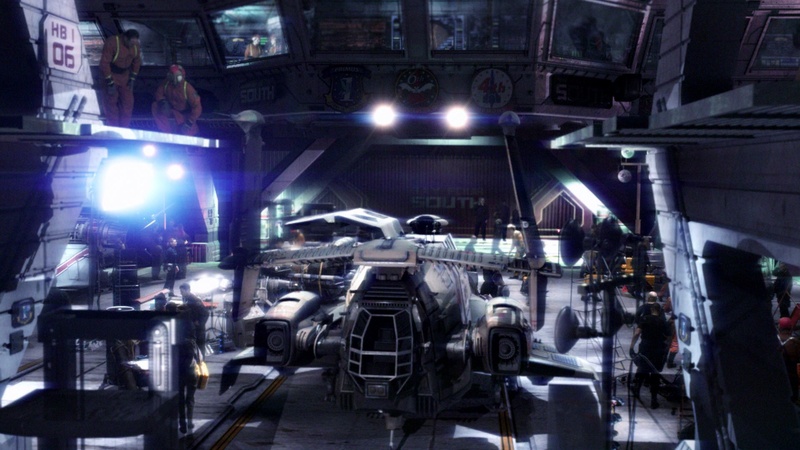 Galactica’s present-day sister-ships seen in the Miniseries and Razor, assuming they didn’t preserve the multi-level Blood and Chrome-style hangar deck, would therefore have an air wing of around 200 planes, with about 160 Vipers and 40 Raptors. Thanks to Lee Stringer, Galactiguise, and the Frak That screencap archive for making this post more possible and/or easier than produce it otherwise would’ve been. This is going to be a short animation, a sort of spiritual successor to my old BSG picture “Bombardment,” and also an actual successor, in that I’m using the same shells and smoke trails. Actually, I ganked the key and fill lights from that scene, too. The first shot is pretty much done as far as it goes. 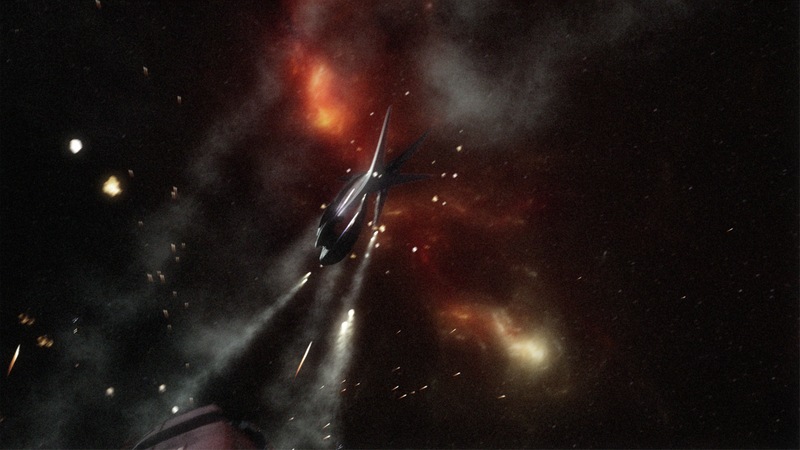 I’m planning on doing another two to four shots in this sequence involving an original series Cylon Basestar being blasted in two by this salvo. I’m going a bit breakout-happy (it already saved my bacon since my first version of the interactive lighting from the shells had an excessively short fall-off distance and I didn’t realize it until I saw everything put together in real-time. It was nice that I could fix that with minutes instead of hours of re-rendering), so I’m thinking about slipping some more stuff into this shot, as well. I found a tutorial on AAA traces that I’m going to try out to see if I can get the wee little guns along the corners of the battlestars to do their thing. I’m also thinking about modeling some extremely low-detail cylon raiders and vipers to buzz around. A flak cloud would be nice, too. 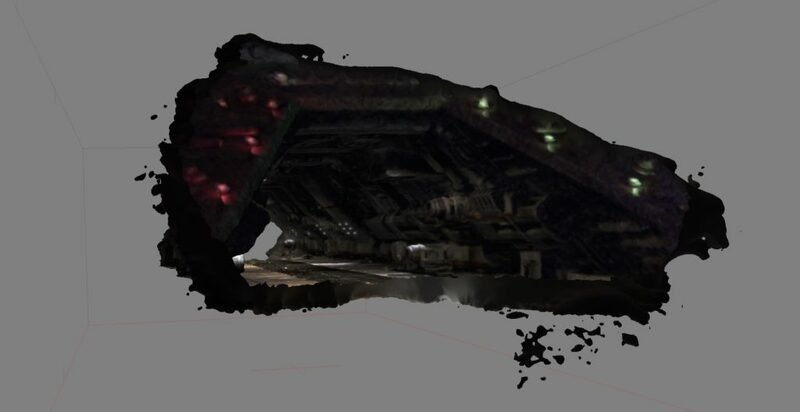 I’m also going to be doing my first real attempt at modeled damage on the basestar, and animating stuff being blasted apart. If anyone knows any good tutorials for flak clouds, modeled damage, or blasting stuff apart in Lightwave, that’d be awesome. Since I hadn’t done much in Lightwave for the past few months and have the chance again with the successful end of my creativity-sapping traditional drawing course, I decided to try out an animation. I wanted something reasonably simple to warm up, so I did a series of four drifty shots of Raffs’ Basestar, assembling them into a montage like the ones used for establishing shots of Basestars in season 3 and 4 of the new Galactica. It also gave me the chance to try out Premiere and After Effects, as well as being my first try at faking radiosity with a spinning light globe and rendering to OpenEXR. I was going to try using Screamernet to set up a little render farm since I have access to more than one computer for the time being, but since it was apparently designed by sadists for sadists, I found it was easier just to grab my dongle, start up Layout on each computer, and set each machine to render a different range of frames.